How many times have you walked through the door and notice that the Sun was shining brightly, the sky was completely blue and you thought "today is a perfect day to take pictures"? And how many times have you returned home with tons of bad pictures? Blame the huge contrast between the highlights and the shadows of the scene. Using graduated neutral density, or GND, filters (this section). Using the bracketing technique or HDR (section 23). In a high contrast scene the difference of stops between the darkest and the brightest tone is very large. In fact, the difference is so great that your camera is unable to capture detail in both tones (underexposing the darkest one or overexposing the brightest one). When this happens, we say that the dynamic range of the scene exceeds the dynamic range of the camera. The dynamic range of the scene exceeds that of the camera. Notice that the shadows have become too dark to expose the highlights correctly. In landscape photography, when the sky has a very bright tone and the landscape is dark. In portrait photography, a backlight. Or, depending on the scene you are facing, you can use a super useful tool: filters. Let's see what types of filters you can use and how to do it. Neutral density filters (ND) that limit light uniformly over their entire surface. Graduated neutral density filters (GND) that limit light gradually (non-uniform) along their surface. This type of filters are very useful for photographing high contrast scenes. To understand how graduated neutral density filters (GND) work, which you will use to successfully capture high contrast scenes, you should first understand how non-graduated or uniform neutral density filters (ND) work. So let me start by explaining in detail the ND filters. A neutral density filter (ND) is a piece of glass or semitransparent resin that you place in front of the lens. You can slow the shutter speed to create beautiful effects without overexposing the highlights. It allows you, for example, to capture the silk effect in the sea during a sunset. You can use larger apertures (without overexposing the scene) to capture a shallower depth of field. It’s useful, for example, if you want to separate the subject from the background in a backlight. The effect you get depends on the number of stops (section 6) that the filter you use subtracts (1, 2, 3 stops...). Another advantage of the neutral density filter is that it subtracts the light evenly. Therefore, it doesn’t affect the contrast or the sharpness of your image. Nor does it produce any color cast (although, unfortunately, this isn’t always the case depending on the filter manufacturer). The adjective “neutral” refers to this lack of color cast. In short, they are opaque sunglasses for your lens. Filters have two formats: circular screw-on or square. Since they should fit into the thread of your lens, they must have a specific diameter, so they are difficult to interchange between one lens and another. When you want to stack several filters by placing one on top of another, they produce vignetting (a darkening towards the corners of the frame). That’s why I recommend that you use the square filters. In this case, to use them, you need a good filter holder. I use one from Lucroit. A filter holder is a structure, generally made of resin, that you screw to your objective with an adapter ring and that allows you to fit the square filter that you want. Since they are not circular or depend on a specific size, they are perfectly interchangeable. So you can use the same filters with different lenses. The filter holder has several slots that allow you to use multiple filters at the same time. No vignetting is produced. The filters’ mission is to block some of the light entering through the diaphragm to the sensor. And to help you have a precise control over the light you want to "subtract", manufacturers offer a whole range of filters with different densities. Here are some examples of filters, depending on their density or reducing capacity. Thus, an ND2 filter reduces 1 stop the light reaching the sensor. An ND4 filter 2 stops, an ND8 filter 3 stops and an ND400 filter between 8 and 9 stops, and so on. Remember, each time you reduce the exposure 1 stop, the sensor captures half the light (section 6). Therefore, a filter allows only 1/2power of the initial light to go through it. In this case, "power" is the number of stops that the filter subtracts. Depending on the light you want to subtract, choose a more or less dense filter. These are the neutral density filters (ND) I have in my arsenal. I have them in two sizes, depending on the sensor of the camera that I’ll use. A 6-stop (ND64 or ND1.8) filter from Lucroit. A 10-stop (ND1000 or ND3.0) filter from Lucroit. A 6-stop (ND64 or ND1.8) filter from Haida. A 10-stop (ND64000 or ND4.8) filter from Hitech Firecrest. Let's look at some examples of how you can use the ND filters. ND filters allow you to use a slow shutter speed to artistically show the motion that occurs in the scene. You achieve this without blowing out the highlights (the brighter tones). You can smooth the movement of the water (silk effect), show the grass moving as the wind blows or you can even make ghostly images of people moving around. If you set the shutter speed you need to achieve a certain effect, the photo is overexposed or you’re forced to close the diaphragm a lot, take advantage of the ND filters power. Because using such a closed aperture you risk losing sharpness due to diffraction. Use an ND filter and you won’t need to close the diaphragm as much. Thus the diffraction disappears. The key is to experiment. To try and fail, to try and fail and to try again. Although ND filters are generally used to capture long exposures, you can also use them when you want to use larger apertures. By doing this you can get a shallower depth of field in bright light situations. For example, the maximum shutter speed of many cameras is 1/4000s. This means that if you want to photograph a subject lit by the Sun, using an ISO 100, you can open the diaphragm as much as f/2.8 to expose it correctly. If you want to open the diaphragm more to get a shallower depth of field and completely separate your subject from the background, your subject won’t be properly exposed, since you can not use shutter speeds greater than 1/4000s. In this case, you can use for example a 2-stop ND filter to reduce the light, allowing you to open the diaphragm 2 stops up to f/1.4 (as long as your lens allows it) while maintaining the exposure but achieving a shallower depth of field. In short, ND filters allow you to use a larger aperture and a slower shutter speed to achieve effects that would be impossible to get without overexposing the photo. In other words, when you use an ND filter, you can reduce the light the sensor gets evenly. In return, you can increase the aperture and/or reduce the shutter speed while keeping the correct exposure. Well, now that you know what a neutral density filter is, what it is for and what you can get with it, let's go with the most interesting part... How to use it! First, take a photo that correctly exposes the area of the scene you want without using the filter. Then set the aperture or shutter speed you need to get the effect you’re looking for. Finally, use the reciprocity law to calculate what filter you need to keep the exposure. With this filter you can use the aperture or the shutter speed that gives you the effect you are looking for and, at the same time, keep the correct exposure. Select the exposure mode: Manual (M) or one of the semiautomatic ones. Select the metering mode (usually the spot metering one). Measure the exposure in key tone. Decide the aperture, shutter speed and ISO settings to get a correctly exposed photo. Decide the aperture or the shutter speed you need to use to get the effect you want. For this, you can check the tables in section 4. Calculate what filter you need to keep the correct exposure. To do so you can use the PhotoPills exposure calculator. Find out how many stops is the exposure increased by using the new shutter speed (or aperture) compared to the test photo. Imagine that you have increased the exposure in 2 stops (+2EV). In that case, you should use a 2-stop ND filter to compensate for the effect and maintain the exposure. Select the exposure triangle settings of the picture you have in mind. Focus and frame the scene. Screw the adapter ring onto your lens, attach the filter holder to the ring, and insert the calculated filter(s). Imagine that you have a coastal landscape before you and you want to capture a silky sea and the clouds conveying motion. To do this, use the Manual exposure mode (M), meter the light in the key tone, in this case the brightest tone in the sky, and adjust the exposure triangle settings until you get a correct exposure. Let’s say you set an aperture of f/11 to get a suitable depth of field, an ISO of 100 to avoid noise in the photo and an shutter speed of 1/125s to expose the picture correctly. You immediately realize that a shutter speed of 1/125s doesn’t allow you to capture the silk effect in the water. You need to use a slower shutter speed, but you don’t want to further close the aperture. So the only alternative you have is to use an ND filter. But what shutter speed do you need? Having a look at the table in section 4, you deduce that you need a shutter speed slower than 1s to achieve the silk effect. The slower the speed, the silkier the water will be. In this case, the easiest way to figure out what shutter speeds you can use with the filters you have is to use the PhotoPills exposure calculator. So open PhotoPills, and in the exposure calculator set that you want to calculate the "shutter speed". Then, enter the settings you used in the test photo: f/11, 1/125s and ISO 100 ("Test settings" in the first screenshot that you have a couple of paragraphs below). Next, enter the settings of the photo you’re looking for ("Equivalent settings"): use the same aperture f/11 and ISO 100 settings. Then, adjust the ND filter stops until you get a shutter speed that allows you to obtain the effect you want. For example, in the second screenshot, you are using a 3-stop filter that allows you to expose for 1/15s. This shutter speed isn’t enough. PhotoPills Exposure Calculator - Test Settings. PhotoPills Exposure Calculator - Equivalent settings with a 3-stop ND filter. By testing other filters, you can see how the shutter speed is slower. For example, if you use a 10-stop filter, you can expose for 8s. This reinforces the silk effect in the water (second screenshot). PhotoPills Exposure Calculator - With a 6-stop filter you can expose for 0.5s. PhotoPills Exposure Calculator - With a 10-stop filter, the shutter speed is 8s. In practice, the best thing you can do is to take photos with different ND filters and their corresponding shutter speed. You can then decide what shutter speed gives you the effect on the water you’re looking for. Now that you know what a filter is, let's go back to the aim of this section: successfully shoot high contrast scenes. This leads us to another type of filters, the graduated neutral density filters (GND). A graduated neutral density filter (GND) is a piece of glass or resin that you can place in front of your lens. But, unlike ND filters, the density of these filters varies gradually on their surface (they aren’t uniform). The GND filters don’t subtract the light evenly on all surfaces, they do it gradually. Some areas subtract more light than others. So you can decide where in the frame you want to subtract more light (or less). When you place the dense area (the one that subtracts more light) over the highlights of the frame, your camera is able to correctly capture a high contrast scene. That is, without having to modify the exposure triangle. They subtract the light gradually. The density varies gradually. First, this gradual variation goes from transparent to a neutral gray tone. Then, this gray’s density gradually increases, subtracting more and more light. To summarize, they are sunglasses for your lens whose crystals have a progressive tint. Although some photographers consider that filters are an artificial tool that alters reality, the truth is that a graduated neutral density filter helps you get just the opposite: capture a photo that is very close to what your eyes see. The dynamic range. It allows you to capture scenes whose brightness level exceeds the capabilities of your camera. This is the best known feature of this filter. The local contrast. Although a graduated neutral density filter generally reduces the contrast between the extremely dark and bright areas of the scene, the contrast of each of these zones increases. This is because the filter brings the extreme tones to the middle tones, which is where the tonal curve of your camera has more contrast (and where your eyes are more sensitive to tonal differences). Therefore, the detail and color of the image improves. This is perhaps the advantage that many photographers don’t know (now you do know!). But it produces great improvements in the final image. You could even use them in scenes where the dynamic range of the scene doesn’t exceed your camera’s. For example, you can use them to accentuate the clouds’ sharpness, or to darken them so they have more importance compared to the rest of elements. In fact, as you will see later, their uses are (almost) infinite. But first let's look at the different GND filters that you can find in the market. As with ND filters, there are circular screw-on and rectangular GND filters. Rectangular filters are the most comfortable and versatile. Remember that the GND filters mission is to control how much light you want the sensor to capture. So, depending on the amount of light you want to subtract, you should choose filters of different densities. The most popular filters have 2, 3 and 4 stops. In the table below you have the naming according to the filters brand. Not all filters have the same transition from the darkest part to the clearest or more translucid part. The transition can be hard or soft. In hard filters the transition between the dark and the transparent area is marked by a line. Use these filters when the scene has a clean horizon (when there are no elements above the horizon). Or when there is an obvious straight line separating the bright tones in the scene from the dark ones. In soft filters, however, the transition is so gradual that you can barely notice the difference going from the dark to the transparent area. These filters come in handy when you have elements above the horizon. That is, when the separation between the brighter and darker tones isn’t marked by a straight line. Unfortunately, filter manufacturers don’t agree on standard gradient values, that is, how fast the filter changes from dark to transparent. So the gradient can vary considerably from one brand and another. These are the graduated neutral density filters (GND) I have in my arsenal. I have them in two sizes, depending on the sensor of the camera that I’ll use. A 3-stop (ND8 or ND0.9) GND filter from Lucroit. A 2-stop (ND4 or ND0.6) reverse GND filter from Lucroit. A 3-stop (ND8 or ND0.9) reverse GND filter from Hitech. Let's see how you should choose the density of your GND filters. To determine the filter density you need (the stops it subtracts), you should calculate the stops difference between the brightest and darkest areas of the scene. 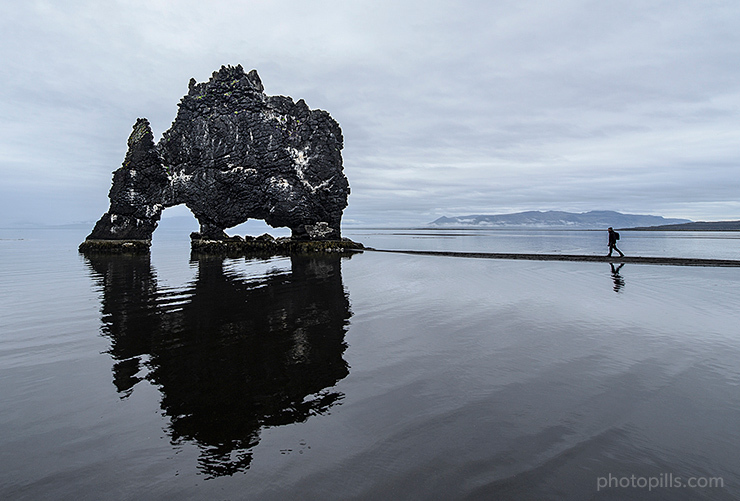 Imagine that you want to use a GND filter to capture the sea landscape in the picture below. In this case, you use a soft-edge filter because you don’t have a clean horizon. A soft-edge filter as well. A reverse soft-edge filter. A reverse GND filter is very dark in the middle and graduated towards the top. The bottom is almost translucent. I'll talk about them further down this section. Take the camera and select the spot metering mode. Now, meter the light in the sky and determine the exposure so that the light meter is centered at zero (5 ⅓ EV). Then meter the light on the rocks and determine the exposure again (7 ⅓ EV). How can you calculate exposure values (EV)? Simply enter the aperture, shutter speed and ISO settings into the PhotoPills exposure calculator and you’ll automatically get the EV. PhotoPills exposure calculator - Calculating the EV ( 7 ⅓) on the sky based on the shot settings (f/11 | 1.6s | ISO 100). PhotoPills exposure calculator - Calculating the EV (5 ⅓) on the rocks based on the shot settings (f/11 | 6s | ISO 100). The exposure difference (5 ⅓ - 7 ⅓ = 2) indicates the stops between the two zones. In other words, it tells you the density of the filter that you should use to match the exposure of that particular scene. However, in my experience, I advise you to use a filter of a somewhat lower intensity if you want to get a natural effect. Suppose you are using the Aperture Priority shooting mode (A or Av) and your camera's light meter estimates a shutter speed of 1/100s for the sky (background) and 1/25s for the ground (foreground) to correctly expose the scene. Taking into account the shutter speed scale, you deduce that there are 2 stops between 1/100s and 1/25s. That is, the foreground needs four times more light to be correctly exposed (zero-centered light meter). In this case, I recommend using a GND filter with a 2-stop density (or even something less). As soon as you start using the filters, it’ll become easier to decide which filter to use to get the photo you are after. Imagine you are on the coast. You have the sea in front of you, and a fantastic rock very close to your position. Although your eyes let you enjoy all the beauty of the scene, your camera isn’t able to expose it correctly. Take a test shot and you’ll notice that you have to decide between exposing for the sky or for the foreground. In the first picture, the sky looks correctly exposed but, in contrast, the foreground looks very dark (underexposed). While in the second one, the foreground is exposed correctly (detail’s been captured), but the sky is too bright (overexposed). Therefore, you should use a graduated neutral density filter. So which filter should you use and how? Before you start playing with different filters, you should decide three parameters: density, transition and position. First, you should determine the density of the filter you need based on the number of stops between the brightest and darkest area of the scene. To calculate the filter density, follow the steps in the previous section. For the rock scene, the exposure difference between the sky and the foreground is 3 stops (1/125s → 1/60s → 1/30s → 1/15s). So you use a 3-stop GND filter. Secondly, you must decide the type of filter transition (hard or soft) depending on whether the bright and dark tones are separated by a line or not. When you have a clean horizon (no elements above the horizon), you can use a hard-edge filter. Otherwise, a soft-edge filter will help make its effect more subtle over those elements that are above the horizon. In any case, I always recommend that you use soft-edge filters. They are more versatile and you also carry less equipment. Your back will thank you! Going back to our example, the scene doesn’t have a clean horizon, there are rocks above it. So you should use a soft-edge filter. The filter transition is also affected by the focal length, the aperture, and the sensor size. Due to the "zoom" effect, the transition looks much softer on a super telephoto lens (focal lengths over 200mm) compared to it how looks on a wide angle lens (focal lengths below 24mm). In addition to this, the greater the aperture, the more blurred the gradient looks, of the shallower depth of field. You also have to take into account the size of the sensor. The same GND filter can work with a full frame camera and not work, for example, in a Micro 4/3 camera because the gradient area is too large compared to the size of the sensor. Before you buy a filter, find out if it works properly your camera. Finally, regarding the filter position, the key is where to place the transition zone from bright to dark. Although you can see the transition zone more or less clearly when you look through the filter (before placing it in front of the lens), the position in which you have to place it with respect to the lens is much less obvious when you look through of the viewfinder. Normally, you get the optimal position of the filter by placing the transition zone in such a way that it matches the horizon of the photo (or the line that separates the bright tones from the dark ones). However, you are likely to get more realistic results by placing it slightly below. If you put the filter in the wrong position, for example, with the transition zone too high from the horizon, you will get a very annoying bright strip just above the horizon. If you place it too low, your background or foreground elements may appear too dark. Be especially careful with those elements that are above the horizon like trees, rocks or mountains. But above all... Don’t be afraid to try, fail and be creative! Perhaps the main problem with a GND neutral density filter is that it limits your composition. Because those elements that are above the horizon can look in the final image darker than the rest of the scene. You can solve this problem with a post-processing software like Photoshop. But in order to do so you should know how to use, for example, luminosity masks. However, you should ideally avoid, if possible, additional tools that force you to you spend more hours in front of the computer than taking photos. We’re almost done with this section. I just have to tell you a couple of more advanced things that I hope you find useful. The reverse GND filter is nothing more than a variation of the GND filter. Its peculiarity is that the darkest part, the one that determines the filter density, is in the middle of the filter, and it progressively brighten towards the top. On the contrary, the lower half is completely transparent (to avoid subtracting light in the foreground). That’s why it’s called reverse. You can mainly use it for photographing backlit sunrises and sunsets with a clean horizon (without elements above). By having the Sun on the horizon (either inside or outside the frame, as in the example I have put below), the central part of the image is the brightest one, so this is where you should subtract more light. In contrast, the top of the image won’t need such a high filter density. These are the reverse graduated neutral density filters (GND) I have in my arsenal. I have them in two sizes, depending on the sensor of the camera that I’ll use. I have one 165x185mm (ideal for full frame sensors) 3-stop (ND8 or ND0.9) reverse GND filter from Hitech. Sometimes it can be interesting to move the filter while the camera is taking the photo. This allows you to adjust the amount of light you subtract in each part of the scene. It also helps you avoid to have traces of the transition line between dark and bright tones in your picture. But I warn you in advance: it isn’t easy at all. It’s very difficult to control how the final photo will be and requires a lot of practice. If you are interested in practicing this technique, I suggest that you take a look at “El uso de los filtros en movimiento”, an article of my friend José B. Ruiz in which he explains it with great detail. Unfortunately, it’s only available in Spanish. Auto exposure bracketing consists of taking a series of photographs of different exposures so that, when blended with an editing program (Lightroom, Photoshop, etc. ), you get a photograph with detail in both the shadows and the highlights. In other words, with the bracketing technique, you can generate a high dynamic range (HDR) image where the dynamic range of the scene fits. This technique allows you to artificially stretch the limited dynamic range of your camera to access a new world of possibilities. A world that you couldn’t reach before because of your camera limitations. Unfortunately you have to pay a small price. Extending the captured dynamic range will inevitably result in reduced contrast in certain tones. To avoid this, you can always adjust the contrast in post-processing. Another major disadvantage of bracketing is that all elements of your scene must be static since each shot must be identical to the others, except for the exposure. In my opinion, you should ideally use the bracketing technique only when a GND filter doesn’t allow you to capture the high dynamic range of the scene. If you can use a filter, you can capture the scene in a single frame, and you also keep the contrast on every area of the frame. Filters are ideal for those scenes where dark and bright tones are separated by a straight line, such as landscapes that include the horizon. On the other hand, use the bracketing technique in scenes with a more complex tone distribution, such as the following photographs. The scene in the photographs above has three tonal zones delimited by the abrupt transitions that occur at its edges: the sea, the rocks and the sky. You would need a customized filter to capture this scene in a single exposure. However, if you were there watching the scene yourself, you would appreciate detail in the three zones because your eyes are easily accustomed to the light differences. In this case, to capture an image similar to what your eyes see, you should use the bracketing technique. I recommend using a sturdy tripod and a good ballhead, although you can also perform a handheld bracketing (if you have a good pulse). In this case I use a high shutter speed and I enable the burst shooting mode enabled. How sturdy should it be? Enough to bear the weight of your camera and your lens. The idea is that it has to be a very stable support even in windy conditions or when you want to get into the water, on the bank of a river or the sea. I use the Gitzo 4542 Systematic together with the Kirk Enterprise BH-1 ballhead. You have to take several shots of the same scene with different exposures. So it’s essential that the frame is always the same. Your camera can’t move! Yes, I know that both Lightroom and Photoshop include very powerful tools that are able to overlay and align photos that have a slight deviation. But the smaller the deviation, the better. And if there is no deviation, great! Make sure to take at least 3 shots, though I'd rather take 5 shots to have an even more precise result. A greater number of exposures allows you to get a more balanced tonal distribution during the post-processing. Let's see how this works using the previous example. In this case, I took 3 shots. The brightest shot doesn’t have the highlights blown up. The darkest shot doesn’t have the shadows clipped, nor noise in the dark areas. The exposure difference between each shot varies according to the taste of each photographer, but I like to have 1-stop brackets, ideally by varying the shutter speed (while maintaining the aperture and the ISO). Remember that each stop involves doubling (+1 stop) or halving (-1 stop) the light captured by the sensor. You can use the bracketing technique to reduce noise in the shadows. Even if your scene doesn’t have a high contrast, your final photo improves reducing the noise in the shadows. Have you noticed that most of the images have more noise in the shadows than in the highlights? You can easily avoid it by combining a properly exposed shot over a slightly overexposed shot. Once at home, sit in front of the computer and follow the steps that Elia Locardi teaches you in the following video to blend the shots in Photoshop: Photographing Horseshoe Bend with Elia Locardi and the GFX 50S (USA). I love theory, but I admit that the best way to help you learn is by seeing examples and practicing. So I can’t think of a better way to help you understand what I’ve covered in this article than showing you lots of examples with real photos – photos that I have made myself. Study them thoroughly and you will become Lightmeter-man... The exposure superhero! Well, maybe I'm exaggerating a bit. But what I do promise is that you’ll learn to expose. My goal is that you learn the logical decisions and the workflow that led me to capture both the effect and the exposure I wanted. This way, no scene will be an impossible challenge. When you photograph the Milky Way, your goal is to capture the stars as big bright spots during the exposure. This implies that, on the one hand, you want to use a slow shutter speed. The slower the shutter speed, the brighter and bigger the stars. But, as you will learn in the guide on how to photograph Stars Trails, because of the Earth rotation from a certain shutter speed the stars stop being big bright spots in the photo, and become Star Trails. And what is that limit shutter speed? The answer is in the NPF rule or the 500 rule. To use the 500 rule simply divide 500 by the effective focal (focal × cropping factor) you use and you’ll get the minimum shutter speed (slowest) that will allow you to avoid Star Trails. It’s very easy to calculate but it has a drawback: it fails in modern cameras with many megapixels. The NPF rule is more accurate, but more complicated. It takes into account the size of the camera's pixels, the aperture, the focal length and the declination of stars. To calculate it you can use the PhotoPills Spot Stars calculator. You can do it even with the Augmented Reality! Normally, the minimum shutter speed is less than 35s. And considering the conditions of low light (it’s pitch black), you should use the highest aperture that your lens allows you (f/2.8, f/4...) to capture the maximum amount of light. Remember that the wider the aperture, the more light and stars you’ll capture. By using a short focal length (14-35mm) to capture most of the landscape and the sky, and a wide aperture to capture as much light as possible, you can maximize the depth of field focusing at the hyperfocal distance. Finally, choose the ISO setting that gives you a correctly exposed photo. Normally you’ll use high ISOs (800, 1600, 3200, etc. ), so be very careful with the noise that is generated. Therefore, first set the aperture and shutter speed to get the photo you want. Then, take several test shots and check the histogram to adjust the ISO giving you the correct exposure. Gear: Camera (full frame is best), wide angle lens, intervalometer, robust tripod and ballhead, flashlights, LEDs and anti-moisture systems (take a look at the gear to photograph the Milky Way). Camera settings: RAW. Turn off the image stabilization function if your lens has it. Focal length: Short focal length (10mm, 14mm, 24mm, etc.) to cover as much landscape and sky as possible. Metering mode: You can’t meter the light because there is none. Determine the exposure by taking test pictures and checking the histogram to see if it is correct. Aperture: The widest that your lens allows you (f/2.8 is great). You need to capture as much light as possible during the exposure. Remember that a large aperture allows you to capture more stars, and that they are larger and brighter. Shutter speed: The maximum possible but avoiding Star Trails. Calculate it with the NPF rule, the 500 rule or with PhotoPills. Usually below 30-35s. ISO: Use the highest ISO possible (1600, 3200, 6400) at which your camera doesn’t produce too much noise. As for the aperture, you need a high ISO to capture more light. White balance: Manual. Start with 3900K if there is no light pollution or with 3400K if there is, and then adjust according to the result. Nevertheless, you can always correct it in post-processing. Where to focus: Focus at the hyperfocal distance to maximize the depth of field. Illumination: Illuminate the foreground if necessary. If you dare, you can use the light of the Moon as a lighting system. Plan your shooting session so that the Moon has a little elevation and brings light to the scene from the side. Take the picture, check that everything is focused and with the lighting you want. Otherwise, refocus to the hyperfocal and/or correct the illumination. Make sure the photo is correctly exposed (check the histogram). Otherwise, adjust the ISO accordingly. If you want to take spectacular photos of the Milky Way, you will find all the secrets in our guide "How To Shoot Truly Contagious Photos Of The Milky Way". When you are photographing wildlife, the chances of being able to approach your subject are minimal. Therefore, you’ll have to use a super telephoto lens (300-600mm). And what happens when you use a super telephoto lens (long focal lengths)? Well, the depth of field you get in the photo is very shallow. So you may be tempted to close the aperture to increase the depth of field. But the truth is that you won’t be able to use a small aperture. Blame the short shutter speed (below 1/1000s) that you have to use to freeze the movement of the animal (or animals). When using a slow shutter speed, you have to use large apertures and high ISOs (and even add light with a flash) so that the sensor captures the proper amount of light to get a correct exposure. Gear: As for the camera, it depends on the type of wildlife. I usually recommend APS-C or Micro 4/3 cameras, but I used a full format one to take this picture. You need a super telephoto lens, a robust tripod and ballhead (ideally a gimbal one). When using a gimbal ballhead your movements are more fluid and safer. Camera settings: RAW. Activate the image stabilization function if your lens has it. Focal length: A long focal length to maximize the subject in the frame. Exposure mode: Aperture priority mode (A or Av). Metering mode: Use the spot metering mode to measure light on the bird and then recompose. In any case, evaluate the light and select the settings taking into account the background of the image. If the bird is against the sky compensate the exposure by 1 stop (+1EV) to ensure a good exposure. It will always depend on the color of the bird. If it’s white, the correction factor has to be higher. If it's black, you barely have to compensate the exposure. Focus Mode: For birds in flight, use the continuous focus mode (AF-C), with shooting priority. This way you can have the bird focused at all times. Everything is easier if you start focusing when the bird is still far away. Aperture: A large aperture to be able to use a fast speed. Shutter speed: 1/1000s or more if you want to freeze the bird’s flight. If, on the other hand, you want to add motion, reduce it to 1/500s or so to capture the wings moving and conveying a feeling of speed in the subject. ISO: Start with a low ISO and crank it up according to the light conditions you are in. The most important thing is to know the limits of your camera. It’s better if you give up and come back another day when the conditions are better than being discouraged by the results you got. White balance: Manual. It depends on the time of day and the quality of light. Nevertheless, you can always correct it in post-processing. Where to focus: Focus on the eyes of the bird. This way you will get the whole head in focus. On this occasion, I was inside a hide so I could work at the height of the bird, and thus get a more visually attractive shot. In this type of photography (and in all, honestly) it’s very comfortable to have the shot dissociated from the focus. Thus, you focus with the exposure lock back button (AEL or AE-L) and you only use the shutter button to take the photo. Take the picture, check that everything is focused and with the lighting you want. Otherwise, and if you can take the picture again, compensate the exposure and make sure the photo is correctly exposed (check the histogram). You will get better results avoiding the central hours of the day. The best time is at dawn or dusk, where the warm light gives a special touch to the final result. As you may have guessed, shooting in burst mode is crucial in this type of photography. Activate the burst shooting mode (and if you can choose the burst speed, set it on High). In this particular photo, when I was waiting in the hide I had an APS-C camera ready with a 1.4x teleconverter and a 500mm lens. When I saw the bird was still approaching, something out of the ordinary, I quickly removed the teleconverter. But I sensed that the bird wouldn’t go away, it would come closer instead. The problem is that if this was the case, my ASP-C would only allow me to capture a simple portrait and not the entire bird. So I quickly changed the body and mounted a full-frame camera. You can see the result above. If it had taken me a couple of seconds more or the bird had come closer, I wouldn’t have gotten it into the frame. Long distance Moon photography requires great stability and a long focal length. You should use a super telephoto lens (between 300mm and 600mm, for example). And what happens when you use a super telephoto lens? As in wildlife photography, the depth of field you get in the photo is very shallow and you also have the problem of stabilizing the gear. This type of photography settings don’t differ much from the previous one, except for the shutter speed. Here you can use shutter speeds of few seconds without having the Moon blurred in the frame. Gear: I recommend an APS-C or Micro 4/3 camera to take advantage of the cropping factor. Tripod, telephoto lens and shutter release. Focal length: A long focal length, from 300mm onwards. It’s better if it’s stabilized. Metering mode: Spot metering mode. Aperture: f/5.6 and f/8 to close the diaphragm towards the lens sweet spot and get a sharp image. The sweet spot of your lens is the f number at which the lens offers maximum sharpness while reducing distortion and chromatic aberration. You’ll find this spot by closing the maximum aperture 1 or 2 stops. Shutter speed: Adapt to the existing light, taking into account that you can use a shutter speed of up to 2s before the Moon is blurred. ISO: The minimum possible, taking into account that the maximum shutter speed you can use is 2s before the Moon is blurred. If the light meter isn’t centered at zero, crank up the ISO gradually, always within the noise limits of your camera. Where to focus: Focus on the element you want to highlight in the foreground. If the distance is long enough, the Moon will be focused as well. For example, with a full frame camera and using a focal length of 500mm and an aperture of f/5.6, the hyperfocal distance is 1,473m (you can calculate it with the PhotoPills depth of field calculator). If the element is at that distance (or higher) you get infinity focus to infinity. In this type of photography stabilizing your equipment is essential. Use a tripod and a bean bag depending on the surface and the wind. You need a shutter release or an intervalometer to shoot successfully. Avoid vibrations at all costs! Take the photo, check that everything is focused and with the lighting and contrast you are looking for. If not, compensate the exposure and make sure the photo is correctly exposed (check the histogram). The full Moon only comes out once a month, check the results by enlarging the resulting image. An interesting trick in this type of photography is locking up the mirror. Although the camera is on a tripod the weight of the body plus the lens can play a dirty trick on you. This photo is unique because of the unexpected result. Thinking of Cartier-Bresson and his decisive moment, this one really was really a true one. It’s the only image in which the two girls (who were partying and are out of focus) moved away from the imaginary line between my camera and the horsewoman. I was really lucky to get this image because, although it wasn’t their intention, the two girls complete the frame of the horsewoman and the Moon. You have a whole world of possibilities when capturing pictures with the Moon. If you want to learn the art of storytelling with the Moon, and learn how to plan any photo you imagine, I recommend you to take a look at our article "7 Tips to Make The Next Supermoon Shine In Your Photos". The contrast created by highlighting a silhouette with the bright light of the Moon makes this type of photography an endless source of ideas. Using the Moon as a stage you have a whole book of stories. Again, it’s a type of photography that needs the use of a super telephoto lens (300-600mm). The silhouette is nothing more than the result of exposing for the Moonlight, choosing the color and texture of the Moon against ambient light. If you expose for the latter, the Moon would be overexposed and without detail. I usually do this type of photography during the nautical twilight (when the sun is below -6 degrees of elevation), although you can also do it in the final stretch of the blue hour. Understanding natural light at every moment of the day helps you know what kind of photos you can capture. Using a short shutter speed to capture the Moon, you can include a myriad of elements in your frame. As you can see in the picture, you can even freeze the flight of a kite. And if you dare, you can go a step further and record a video using Moon silhouettes to tell a story. In this article we show you how to create amazing videos with Moon silhouettes. Gear: I recommend an APS-C or Micro 4/3 camera to take advantage of the cropping factor. Tripod, super telephoto lens and shutter release. Metering mode: Spot metering mode because you have to correctly expose for the Moon. Since the sky is dark, if you use another metering system, the light meter can be confused, producing an image of the Moon without any detail. Aperture: To get enough detail and sharpness use intermediate apertures, using f/8 as a starting point. But if you use a fast super telephoto lens, you start to get enough detail from f/5.6 on. Shutter speed: If the speed is very slow, the Moon and the main subjects are blurred. I recommend that you use a speed of around 1/250s to freeze people moving around. Although it goes against the rule between focal distance and minimum speed, photographing the Moon is different. ISO: It’s preferable to start with your camera’s base ISO (the lowest) and crank it up as long as the shutter speed is less than 1/125s. Sometimes it’s preferable to increase the ISO than to open the diaphragm, so you can control the depth of field or general sharpness of the image. Remember that you should know the sensitivity limits of your camera (noise). White balance: Manual. It depends on the moment of capture. You’re going to take this image before the Sun comes out or after it’s set. Therefore, a warm temperature can reinforce the orange color of the Moon as long as your composition includes the Moon near the horizon. On the contrary, when the Moon is quite high, select a 4000K white balance approximately if you want to maintain a temperature that corresponds to its natural color. Nevertheless, you can always correct it in post-processing. Where to focus: Focus on the element you want to highlight in the foreground. If the distance is long enough, the Moon will be focused as well. For example, with a full frame camera using a focal length of 500mm and an aperture of f/5.6, the hyperfocal distance is 1473m (you can calculate it with the PhotoPills depth of field calculator). If the element is at that distance (or higher) you get infinity focus to infinity. In this case it was about 1500m away from the old stone structure, so the Moon is focused. The sense of blur of the Moon is nothing but the effect of the atmosphere near the surface of the Earth that clouds the vision when the Moon is so low. Take the photo, check that everything is focused and with the lighting and contrast you are looking for. If not, compensate the exposure and make sure the photo is correctly exposed (check the histogram). The Moon doesn’t wait for you: you’ll see how fast it moves along your frame. As you can see in this image, I wanted to convey motion adding a kite. The quick movement of the Moon almost prevents the person holding the kite to go on stage. It’s relatively easy to take a photo of the surface of the Moon because, since there are no additional elements in the frame, you just have to focus on correctly exposing one subject. It requires great stability and a long focal length. Therefore, you should use a super telephoto lens (300-600mm). Don’t photograph the full Moon only. The previous or next phases emphasize the contrast of the craters and you can observe in more detail the volume of the lunar surface. In this case I included Mars (that tiny little dot on the left) in the frame along with the crescent Moon. Focal length: A long focal length, starting at 300mm. Better if it’s stabilized. Aperture: f/5.6 and f/8 to close the diaphragm towards the lens sweet spot and get a sharp image. Shutter speed: From 1/125s on, taking into account that, with slower shutter speeds (no more than 2s) and with the equipment well stabilized, you can capture the Moon correctly exposed. ISO: The minimum possible, taking into account that the minimum shutter speed you can use is 2s before the Moon is blurred. If the light meter isn’t centered at zero, crank up the ISO gradually, always within the noise limits of your camera. White balance: Manual. It depends on the intensity and quality of moonlight. Nevertheless, you can always correct it in post-processing. Where to focus: Focus directly on the Moon. In this case I used the Live View function on the LCD of my camera to focus accurately. Then I zoomed the image, always with the Live View function on, until I saw the detail of the Moon's surface. Then, I slowly turned the focus ring of the lens until the detail of the surface was tack sharp. If you’re not used to focusing manually, turn the focus ring very subtly and when you notice that your subject (the Moon) is focused, keep turning the ring until you go a little out of focus and then, turn the ring in the opposite direction to get everything in focus again. This way you’ll see very clearly how everything is now in focus again. Take the photo, check that everything is focused and with the lighting and contrast you are looking for. If not, compensate the exposure and make sure the photo is correctly exposed (check the histogram). An interesting trick in this type of photography is locking up the mirror (if it has one, of course :P). Although the camera is on a tripod, the weight of the body plus the lens can play a dirty trick on you. Capture the different phases of the moon with the same settings. You’ll see that when blending them all together in a composite you’ll get a surprising composition. Capturing a single long exposure Star Trails is a challenge for any photographer and for any sensor, depending on how much noise it produces. But it’s also a very rewarding and exciting experience that I recommend living. Look for locations without light pollution. Avoid, if possible, the full Moon. It reflects a lot of light and makes it difficult to capture stars. Try to be in a group. Doing night photography alone is dangerous. I myself have fallen more than once but I’ve been lucky to be with more people. In our guide on how to photograph Star Trails you’ll find many more examples and step by step explanations. In this case, and contrary to photographing the Milky Way, the idea is to show Star Trails in the picture, not stars as big bright spots. Taking into account the low light conditions (it’s pitch black) you are in, use your lens largest aperture (f/2.8, f/4...) to capture the maximum amount of light. The larger the aperture, the more light and more stars you capture. Work on a composition including a compelling foreground that enhances the Star Trails. Include a tree, a building or a model in your frame and your final image will be truly powerful. Using a short focal length (14-35mm) to capture most of the landscape and the sky, and a large aperture to capture the maximum light possible, you can maximize depth of field focusing at the hyperfocal distance. Finally, choose the ISO setting that results into a correctly exposed photo. As usual, use low ISOs (100-200) to avoid noise during a long exposure. In this type of photography, I recommend doing a few seconds exposure test (20-30s) at a high sensitivity (ISO 1600, 3200). Once you get a correctly exposed photo, bring down the ISO and apply the reciprocity law to calculate the equivalent shutter speed. For calculations you can use the PhotoPills exposure calculator. Gear: Camera (regardless of its sensor size), wide angle lens, intervalometer, robust tripod and ballhead, flashlights, LEDs and anti-moisture systems (take a look at the gear to photograph Star Trails). Focal length: Short focal length (10mm, 14mm, 24mm, etc.) to cover as much landscape and sky as possible. Also, turn off the long exposure noise reduction, if your camera has this function. The reduction is applied while you are taking the picture, so in a 20s image, on most cameras you will have to wait another 20s for the camera to process the image trying to eliminate noise. Metering mode: You can’t meter the light because there is none. Determine the exposure by taking test pictures and checking the histogram to see if it is correct. You can do reciprocity calculations with the PhotoPills exposure calculator. Aperture: If you use the widest aperture (for example f/2.8), you can capture many stars. But the shutter speed may not be as slow as you want, getting shorter Star Trails than what you’re looking for. In that case, close the aperture a bit (1 or 2 stops). You won’t be capturing so many stars, but you'll get longer Star Trails and sharper stars by closing the diaphragm towards your lens sweet spot. Shutter speed: The maximum possible to be able to capture Star Trails as long as possible. A shutter speed of 30-60min is more than enough. ISO: Considering that you shoot a single very long exposure to get your Star Trails as long as possible, both the shutter speed and noise determine the aperture and ISO settings you can use. The biggest problem you have is noise. Therefore, keep the ISO as low as possible (100, 200). Then choose the appropriate aperture to get the shutter speed you’re looking for. If you want to take spectacular Star Trails pictures, you’ll find all the secrets in our article "The Definitive Guide to Shooting Hypnotic Star Trails". Shooting multi long exposure Star Trails has many advantages compared to capturing them in a single exposure. One advantage of capturing multiple short exposures and then blending them together in a single frame is to prevent the sensor from overheating. By doing this you get an image without thermal noise. It’s also easier to remove distracting elements such as traces of airplanes, satellites or other light sources, as well as tripod vibrations. You also have more control over the foreground illumination because you can add light in the first and last photo. So, you have two options to choose the base photo. In addition to this, the night is much more productive since you can go home with a photo, a timelapse and the blended result of all the pictures you take. A nice shooting session! The best example of a productive shooting session are the meteor showers. Again, in our guide on how to photograph Star Trails you’ll find many more examples and step by step explanations. To expose this type of image, take a test photo with a very wide aperture (f/2.8 for example), a short focal length (14mm for example), a shutter speed of 20-30s and a high ISO (1600-6400). Check the histogram and, if necessary, adjust the shutter speed or ISO to obtain a correctly exposed photo. Once you have the exposure you want, you just have to let the camera continue taking photos for hours. Focal length: Short focal length (10mm, 14mm, 24mm, etc.) to cover as much landscape and sky as possible. Also, turn off the long exposure noise reduction, if your camera has this function. The reduction is applied while you’re taking the picture, so in a 20s image, on most cameras you will have to wait another 20s for the camera to process the image trying to eliminate noise. Aperture: If you use the widest aperture (for example f/2.8), you can capture many stars. Shutter speed: It depends on how you want the final photograph to look like. You can take pictures using the NPF rule or the 500 rule to have the stars as big bright spots or use a slower shutter speed if you don’t mind minor Star Trails. After all, you'll use a software to stack the photos and get the final Star Trails image. You can use the PhotoPills Star Trails calculator to calculate the total shutter speed you need to get a certain Star Trails length. ISO: If you take multiple exposures to obtain Star Trails long enough, both the shutter speed and and noise set the aperture and ISO settings you can use. The biggest problem you have is noise. So, keep the ISO between 400 and 1600, depending on how much light you work with. If you want to capture the color of the stars, don’t go over ISO 1600. By doing so you’ll preserve the colors of the stars. If you crank up the ISO too much you’ll overexpose them and you’ll have white trails. Illumination: Illuminate the foreground if necessary. If you dare, you can use the light of the Moon as a lighting element. Plan your shooting session so that the Moon has a little elevation and brings light to the scene from the side. In this type of photography you just need illuminate, if necessary, the first and last image. Then decide which one you like best and use it as a base photograph. Check that everything is focused on the first photo. Do all the tests at the beginning because, once you start the shooting, you can’t change anything. Make sure the photo is correctly exposed (check the histogram). Otherwise, adjust the ISO accordingly. Once again it’s important to remember that light is the essential element to take a photo. Pictures taken in sunlight will change their look as the Sun's elevation changes. Knowing the daylight phases, and depending on the elevation of the Sun, you can know what light you’ll have at a precise moment of the day. This way you know when is the best time to take a specific photo. The best moments to photograph a landscape are when the Sun is low, near the horizon, giving you an awesome light to enhance colors, shapes and textures. The light phase that you enjoy with the Sun near the horizon is called golden hour (Sun elevation between 6 and -4 degrees). During this time of day, the sky becomes bright, the clouds can pick up orange, yellow, magenta, red and blue colors. The light is soft and diffused. Then, the sky becomes more bluish when entering what is called the blue hour. This moment happens when the Sun is between -4 and -6 degrees below the horizon. Don’t worry about memorizing degrees, PhotoPills tells you the exact hours of the golden hour and the blue hour for a specific location. Gear: Camera (regardless of its sensor size). A wide angle lens if you want a general landscape or a telephoto if you want to capture an abstraction of it. An intervalometer. A robust tripod and ballhead. Sometimes, depending on the terrain you can use a bean bag that give a lot of stability. Camera settings: RAW. Turn off the image stabilization function if your lens has it. Sometimes and depending on the camera and lens you use, it may be useful to lock up the mirror as I did in the photo above. However, you don’t need to do it if you’re a using a shutter speed slower than 1s. Focal length: It depends on the type of landscape you want to capture. You can use from a small focal length (10mm, 14mm, 24mm, etc.) to cover as much landscape and sky as possible to a telephoto or super telephoto lens, as I used here (500mm). Metering mode: Spot metering mode. Meter the brightest area of the scene you want in detail and overexpose it by 1 or 2 stops (+1EV or +2EV). Then, recompose, focus and shoot. Aperture: From f/4 to f/16. Be careful not to use from f/16 onwards to avoid diffraction because it ruins the sharpness and quality of the image. Shutter speed: Since you’re shooting in Manual mode (M), the shutter speed is determined by the aperture-ISO combination you select. Here, your personal style comes into play depending on how much depth of field you want in the photo. ISO: In landscape photography you usually use a tripod, although you may not need it if you have other intentions. Therefore, use the minimum ISO you can. Take the picture and check that everything is focused. Make sure the photo is correctly exposed (check the histogram). Otherwise, adjust the exposure accordingly. Nikon D4s | 14mm | f/5.6 | 10s | ISO 200 | 7500K | 4-picture panorama | ND64 (6 stops) filter and GND 0.9 (3 stops) filter to balance the sky with the foreground (darker). This quote of José B. Ruiz, great photographer and friend, arises a doubt referring to what he means by "serious". For me, José Benito considers you to be serious if you master the exposure. Neutral density filters (ND) that limit light uniformly over their entire surface. They can be circular screw-on or squared filters. Graduated neutral density filters (GND) that limit light gradually (non-uniform) along their surface. This type of filters is very useful for photographing high contrast scenes. Except in few exceptional cases they are usually rectangular. An ND filter function is to reduce the intensity of light going through your lens. The filter should be neutral, without any color cast. I use the GND filters to balance the scene contrasts. Depending on my intention I choose a certain filter density or another. Usually, a 3-stop difference is enough. An adapting ring to fit the filter holder on your lens. A set of ND and GND filter. Focal length: It depends on the type of landscape you want to capture. You can use from a small focal length (10mm, 14mm, 24mm, etc.) to cover as much landscape and sky as possible to a telephoto or super telephoto lens. Metering mode: Spot metering mode. Meter the brightest area of the scene you want with detail and overexpose it by 1 or 2 stops (+1EV or +2EV). Then recompose, focus and shoot. When working with a GND filter, your intention is to balance the contrast of the scene. Therefore, study the scene in advance to observe the light difference in stops between the highlights and the shadows (section 9). Once you know the stop difference, place the corresponding filter. Always choose a filter with less density (less stops) than what you’ve metered in the scene. Thus you avoid an unreal image in which, for example, the sky is darker than the ground. Once the filter is set up meter the highlights and, if necessary, compensate the exposure. Aperture: From f/4 to f/16. Be careful to use from f/16 onwards to avoid diffraction because it ruins the sharpness and quality of the image. Shutter speed: Since you’re shooting in Manual mode (M), the shutter speed is determined by the aperture-ISO combination you select. Here, your personal style comes into play depending on how much light you want in the photo. However, I usually recommend using slow shutter speeds. If you’re using an ND filter, first take a test photo without the filter to get the exposure you are looking for. Then, calculate the equivalent shutter speed when using the filter. You can use the PhotoPills exposure calculator to calculate the shutter speed you need when using a filter. Imagine that you’re facing a brief sunset or sunrise and you want to use a neutral density filter of 10 or 16 stops. You’ll probably only have one chance to photograph it. Plan the photo well to take advantage of it! Were you expecting another picture perhaps? Orchids are one of the most photogenic species of flora, and because of its slender form, Anacamptis pyramidalis wins the first prize... Why not take a good portrait to enhance the shape and attributes of this plant? In this type of photography the subject is the only element. This discipline is practiced in the field, without disturbing the models, using only the light of a flash to blow out the background. It’s a relatively simple technique. A white background (I generally use a medium light window to completely blow out the background) with a flash behind, a flash with a diffusing window at 45 degrees as the main light and a reflector opposite the main flash. Start by taking test photos until the background is blown out. Check it on the LCD of your camera with the "blinkies" turned on. Once the backlight is correctly overexposed (without part of the rear light contaminating the subject) turn off the flash in front of you. Then turn on the front flash at about 45 degrees and place it close enough to create soft shadows. Take several test shots to see how much light the flash needs to illuminate the subject backlit (created by the rear flash) by adjusting only the flash power. Start at a 1/16 of power and change it gradually. Keep in mind that if you change the ISO or the aperture you change the whole exposure, including the background light. This type of portrait makes the plant (or model) unique, and it allows the spectator to fully enjoy it. Gear: Camera (regardless of its sensor size). A macro or telephoto lens to isolate the subject. Lighting equipment: A portable flash with a diffusing window placed against the subject, a flash at about 45 degrees from the subject with another diffuser window and a reflector on the opposite side. Camera settings: RAW. Turn off the image stabilization function if your lens has it and you’re shooting with a tripod. Focal length: Any macro focal length (60mm to 200mm). Another option is a focal length starting at 200mm with a telephoto lens. Metering mode: Spot metering mode. Meter twice, once on the background (your intention is to leave it white) and then on the flower. The flash light is key to get the correct exposure. Aperture: By having a white background without any texture, the aperture may be narrow (f/11, f/16). That way you get detail of the whole flower. Shutter speed: Since you’re shooting in Manual mode (M), the shutter speed is determined by the aperture-ISO combination you select. ISO: The lowest possible to avoid losing image quality. White balance: Manual. Use an X-Rite ColorChecker Passport card to calibrate the light and get the actual color of the flower. Nevertheless, you can always correct it in post-processing. Where to focus: Focus on an intermediate point of the orchid so that the whole plant is sharp. Take some test shots and check that everything is focused. Make sure the photo is in focus and correctly exposed (check the histogram). Otherwise, adjust the exposure accordingly. If you like this photo don’t miss the work of its maximum promoter: Niall Benvie. A mother is everything. This image, which already has a message of tenderness, is even more direct in black and white. I really like taking black and white portraits with black background. The model is dressed in black as my intention is to blend her dark clothes with the black background. So I only show what I want: hands, face and baby. Looking at the EXIF data below the photo you can deduce that this image isn’t exposed with a strobe light. The strobe light is a light source that continuously produces a series of very short flashes. It’s generally used to take multiple exposures of the phases of a movement. In fact, this image was taken in the studio with the help of a continuous light source as the main light, located on the left side, and a reflector on the opposite side. When I take this type of photographies I have the best assistant, my dear Nikon 85mm f/1.4. This lens never disappoints me. It always works wonderfully even though it’s difficult to master, especially in its maximum aperture. Gear: Camera (regardless of its sensor size). Medium telephoto lens (±85mm). Lighting equipment: A continuous light bulb (1000W) with a diffusing window and a reflector on opposite the side to brighten the shadows. Focal length: Any medium focal length (50mm to 200mm). Metering mode: Spot metering mode on the model skin. Aperture: Choose the widest aperture possible to artistically take advantage of the shallow depth of field you have. Shutter speed: In this type of portraits the shutter speed is relatively slow due to the continuous light. ISO: Once you have the aperture, use the minimum ISO that allows you to get a correct exposure without the blurring the picture. White balance: Manual. Use an X-Rite ColorChecker Passport card to calibrate the light and get the actual color. Nevertheless, you can always correct it in post-processing. Where to focus: Focus on the baby's eyes, located in the same focal plane as his mother. This allows you to get the models focused even if you’re using the maximum aperture. When you take baby portraits, try to make them with natural or constant artificial light so you don’t bother the little baby with strobe lights. An outdoors backlit portrait has its charms. On the one hand, it’s an opportunity to get a good bokeh. On the other hand, you can balance the lights, giving to the photograph a very peculiar atmosphere. Another type of backlit portraits are those in which you use the sunlight as an additional element in the image. Thus, you get silhouettes on a bright background that often convey drama. You can also use the Sun to sketch out the model. In this case the image is a good example for you to understand, along with the session making of, how you can take this type of picture. Raquel, the model, is backlit, at the mouth of the port of Ciutadella de Menorca. A 110cm octobox gently illuminates the model, while the Sun is setting behind her. I moved the light source closer and closed the diaphragm in order to use a shutter speed that synchronized well: 1/250s in this case. As Raquel was in shadow a 1/8 flash power was enough to fill her body with soft, diffused light and illuminate her. In portrait, I don’t fail when I use my dear Nikon 85mm f/1.4. It’s a spectacular lens for both portrait and landscape. Lighting equipment: Studio flash powered with a portable battery and with an octobox diffuser window. Metering mode: Use the spot metering mode so you can meter the light efficiently and then control the backlight. In this case, meter the background light first. Keep in mind that the exposure for the background you are looking for doesn’t have to be correct. Sometimes it can be interesting to have your background over or underexposed. Once you have exposed for the background use the octobox to change the main flash intensity. Use the "try and fail" method to determine the intensity you are looking for. Aperture: It depends on the idea of photo that you have in mind. In this case I used a narrow aperture to have a great depth of field. This photo is an exception within my portraits, since I always open the diaphragm a lot to create pleasing bokehs. Shutter speed: As I pointed out above, I used the maximum synchronization speed of my camera, 1/250s. Where to focus: Focus on the model's eyes. I recommend doing this type of photography during the golden hour, when the quality of the light is spectacular. In studio, lighting is essential to get a good portrait. Usually, when you work in a studio the conditions are rarely completely dark. There is always a light source (a fluorescent, a light bulb...) that can become a small obstacle when taking the picture. If you use a shutter speed of 1/200s or 1/250s (as long as they are within the flash sync range), you avoid the ambient light from the room or studio to interfere with the final result. The lighting scheme of this photograph is simple. I used a flash as the main light to the right of Maty, the model, and a less powerful one on the opposite side to fill the shadows up. To the left of the frame and from the background, another flash with a snoot sketches out the back of Maty. Gear: Camera (regardless of its sensor size). Medium telephoto lens (±85mm) to get as close to the model as possible. Lighting equipment: A set of three studio flashes with different powers, two with a rectangular diffuser window and another one with a snoot to sketch out the back of the model. Metering mode: In the studio, use the metering provided by the handheld light meter. Meter the main flash light (the light meter tells you which combination of aperture, shutter speed and ISO you’ll need for a given light intensity). If you have the handheld light meter at ISO 100 and an shutter speed of 1/250s for example, the light meter indicates the aperture required for that given light intensity. Once you know it, you can change the aperture and the shutter speed, always taking into account the reciprocity law. You can use the PhotoPills exposure calculator if you wish. Aperture: It depends on the idea of photo that you have in mind. In this case I used a narrow aperture to have a great depth of field. Shutter speed: Since you’re shooting in Manual mode (M), the shutter speed is determined by the aperture-ISO combination you select and the synchronization speed limit of the flashes (1/250s). ISO: Use the minimum ISO that you can. White balance: Manual. Use an X-Rite ColorChecker Passport card to calibrate the light and get the actual colors. Nevertheless, you can always correct WB in post-processing. Where to focus: Focus on the model's eyes. The first thing that should capture the attention of the viewer is a sharp and deep look. On the 23th and 24th of June, horses and crowds fill the streets of Ciutadella to enjoy the Sant Joan festival. The absolute protagonist of these festival of centenary tradition is the athletic and black menorquín horse. The horses, together with their avid horsemen, the caixers, make people crazy with their jumps and pirouettes. In the image above the dust from the sand in suspension further enhances the dynamism of the scene. In street photography the most important thing is not missing the photo, so I don’t recommend shooting in Manual mode (M). Instead, use the Aperture Priority mode (A or Av) and shoot in burst mode (set on High) so the camera helps you both expose and maximize the chances of capturing the moment you are looking for. Gear: Camera (regardless of its sensor size). In general, use a fast fixed focal of around 35mm equivalent. You can also use a telephoto lens like I did in this case. Focal length: Use a telephoto lens to isolate the horse. Exposure mode: Aperture Priority mode (A or Av). The speed of the horses’ movements and people moving around force you to be fast while exposing. I also suggest that you take this type of photos using the burst mode so you don’t miss the photo. Metering mode: Use the spot metering mode on the hair of the horse. Then, underexpose by 1 or 2 stops (-1EV or -2EV). I have to say that in this type of photography I always take the risk and prioritize the light of the main subject, whatever this subject is. In this case, the bright light of the background (early afternoon) highlights even more the slender figure of the caixer and his horse. Aperture: Choose a wide aperture (depending on your lens, between the widest possible and f/5.6) to be able to shoot at a fast shutter speed. Shutter speed: The shutter speed is determined by the aperture. Using a wide aperture, a shutter speed of 1/1000s is fast enough to freeze the jump. ISO: Use the minimum ISO possible to minimize noise. Don’t change it until the light dims and you are forced to open the diaphragm further. First adjust the shutter speed and, finally, the ISO. In street photography the moment you want to capture is more important than the exposure itself. I often select the automatic ISO setting a range in which the noise doesn’t affect the image quality. In my case, I set a range from 100 to 1600 ISO. White balance: In manual almost always. But if you walk around locations where the color temperature varies a lot, put it in automatic. Where to focus: In this case, on the horse's head, to ensure that the eyes are focused. As a rule of thumb, when I’m doing street photography I like to stay in a specific spot and work with an appropriate scenario. Then, I wait for something to happen. I focus the scenario in advance and wait for something to happen, that unexpected moment. It’s a matter of waiting and having patience. During the blue hour the sky turns into a bluish color with touches of oranges and yellows on the horizon. It's a magical moment for urban landscape photography. The orange tones of the city complement each other perfectly with the intense blue. Closing the diaphragm at f/13, as I did in this case, you manage to get a starburst effect on the lights of the streetlamps and the lighthouse. This effect occurs because the light is scattered through the blades of the diaphragm. In this case, I used a quite long focal length to compress the urban element a little, so the Moon plays an important role in the composition. On top of it, I managed to capture the Moon lit by earthshine. Have you seen how the dark area of the Moon is perfectly visible? This occurs because the Earth reflects the light of the Sun on the dark area of the Moon. That light is called earthshine. Focal length: Any focal length, it depends on the idea you have. Metering mode: Use the spot metering mode in the brightest part of the scene you want in detail. Then, overexpose by 1 or 2 stops (+1EV or +2EV). In this particular case, I metered on the left promenade while it was being lit by the streetlamps. Aperture: Narrow enough to get a good depth of field and the starburst effect of the lights. I recommend using an aperture from f/11 onwards. Shutter speed: The shutter speed should be long enough so your scene is properly exposed. In this case, the metering indicates that 2s are enough but you can go up to 8s. A tripod, a shutter release and, if you have a DSLR, the mirror lock up (from 1/15s to 1s) are essential. ISO: When working with a tripod, use the lowest ISO possible. White balance: Manual. It depends on the time of day and the quality of light. Nevertheless, you can always correct it in post-processing. In this photo I set 3550K to balance the oranges of the scene while maintaining a blue sky. Where to focus: Focus at the hyperfocal distance to maximize the depth of field. In this case, I focused at about 20m (the hyperfocal was at 19.05m). So I could have everything focused from more or less 9.5m to infinity. I also managed to capture the coast of the island of Mallorca perfectly sharp. When you look at the photo, you get the impression that the image was taken with a wide angle but with a shallow depth of field. This photo is the result of 57 frames blended with the software PTGui Pro. The worst part of the work was for my daughter Aina, who had to remain completely still during the session. The Brenizer method, named after its creator Ryan Brenizer, is a technique that consists in making a series of photographs with a fast telephoto lens to create a panorama. The result is very impressive. You get a photo with a very shallow depth of field, so it looks like you've taken it with a wide angle. But, at the same time, the image has the typical bokeh of any medium or long fast telephoto lens. I recommend you to use at least an 85mm lens or longer, and if possible, with a minimum aperture of f/2.8. The faster the lens the more impressive the effect. Gear: Camera (regardless of its sensor size). Medium telephoto lens from 85mm onwards. A robust tripod and ballhead if you’re using a heavy telezoom lens. Focal length: Any focal length from 85mm onwards, it depends on the idea you have. Metering mode: Use the spot metering mode in the key element of the scene. In this case it doesn’t matter if you don’t have any detail in the background, it depends on the bokeh you want to create. Aperture: As wide as possible. Shutter speed: The shutter speed has to be fast enough if you’re doing a portrait so it doesn’t come out blurred. Otherwise, use the one that suits you if you’re shooting on a tripod. ISO: It depends. If you don’t shoot with a tripod, use an ISO that allows a shutter speed fast enough to prevent a blurred image. If you’re shooting with a tripod, use the lowest possible ISO. Where to focus: Focus on the key element of the scene (a person, a natural element…). Once it’s in focus set the AF in manual. Take the picture. This is a panorama of many shots. If you’re photographing a person, you have to be fast enough so that the person stays still during the whole shooting. Otherwise, you’ll end up with a bunch of pictures that are hard to stitch. Make sure the photo is correctly exposed (check the histogram). Otherwise, adjust the exposure accordingly. Stitch the pictures using your favorite panorama software. A night with a lead colored sky can be attractive if you see a storm. Lightnings are both fascinating and dangerous, so you have to be safe to photograph them. In the case of the photo above, I took it from the window of my bedroom. Lightnings are pretty unpredictable. Be extremely patient and have the camera ready at all times. In addition, your priority is to capture the maximum of lightnings, so it’s best to opt for a long exposure. That day I wanted to capture a lightning no matter what. First, I calculated the exposure for the mill. Then I set the intervalometer to shoot an 8s picture every 2s. The camera spent 2h working while I quietly read a novel lying on the bed. Gear: Camera (regardless of its sensor size). A wide angle lens if you want a general landscape or a telephoto if you want to capture an abstraction of it. An intervalometer. A robust tripod and ballhead. Metering mode: Spot metering mode on the white buildings that are to the right of the mill to then overexpose them so as not to blow out the whites. Aperture: It depends on the depth of field you’re looking for, although it will usually be enough for you to focus the lightning and what’s around its. In this case I used an aperture of f/5.6 to be able to have a good depth of field. Shutter speed: Each case is very particular. I recommend you try out various shutter speeds until the buildings are correctly exposed. In the case of photography, the shutter speed for the buildings and the mill to be correctly exposed was 8s. ISO: Use the minimum ISO you can. New Year’s Eve is a good opportunity to shoot fireworks. To get a spectacular picture, try to include more than one crackling palm tree in the frame. The challenge is to do it in a single frame. The most common way to do this type of photography is shooting in Bulb mode. Keep the shutter open and, as fireworks appear, cover the lens intermittently (ideally with a black card or, if you don’t have one, with a black t-shirt). If you don’t cover it, your image will be overexposed. In addition to this, there is another system. Actually, it’s the one I have used in this image: the Live Composite function that some Olympus cameras have. This program allows you to see in real time (live) how the photo is generated by adding the different lights. In the image above you can see how the Live Composite has been adding all the new lights (fireworks) while keeping those of the castle. Camera settings: Live Composite. If your camera doesn’t have the Live composite mode, set the RAW one. Exposure mode: Live Composite. If your camera doesn’t have the Live composite mode, set the Manual (M) one. Metering mode: If your camera has the Live composite mode, you don’t have to meter. Otherwise, set the spot metering mode and meter on the key subject. Here, the castle. Aperture: Since I was using a Nikon lens with the Olympus adapter, I shot at f/8 to take advantage of the lens sweet spot, considering that it could lose quality because it’s not a lens adapted to the Micro 4/3 system. Shutter speed: The advantage of using the Live Composite mode is that the shutter can remain open for a long time as it will only add new lights to the frame. If your camera doesn’t have the Live Composite mode, select the Bulb mode and cover the lens intermittently. It’s the only way to prevent the photo from being overexposed. Do several tests to determine the gap between covering and uncovering the lens. ISO: Use the lowest ISO possible. White balance: Manual. It depends on the fireworks color (if there is any). Nevertheless, you can always correct it in post-processing. While I was planning this photo, I knew that I had to get far enough away to work quietly and avoid as much as possible the pressure from the spectators. It’s important to work on a good framing. In this case, the Castle of Sant Nicolau balances the composition of the image. Photographing orchids in season is a therapy for me. I love to photograph them because it allows me to enter into their micro world. You see things differently when you lay on the floor. That day I found a huge colony of Ophrys speculum. About 600 specimens lived in an area with low grass, and I thought that the spot was great to photograph them. I was looking for a graceful and beautiful plant. And I also wanted to convey into the frame what my eyes saw: hundreds of orchids placed randomly in a clear field. On this occasion, the evening dusk light help me get what I was looking for. Gear: Camera (regardless of its sensor size). A macro lens, but you can also use a fast lens with an extension tube. I didn’t used a tripod here. A bean bag helped me stabilize the image and blend the grass in the foreground with my subject. Focal length: A 105mm macro lens. Depending on what I want to shoot I use a 200mm f/4 lens. Metering mode: Spot metering mode. In this case, I metered on a small area of the plant. After metering, the light meter warned me of a slight overexposure so I underexposed by half a stop (-½ EV). Aperture: Depth of field is essential and your artistic taste is what determines the aperture. Here, the other orchids were a bit far away from my subject, so I decided to use an aperture of f/8 to blur the other plants while keeping their orchid shape. Shutter speed: It depends on your aperture. Use the PhotoPills exposure calculator to spare you the calculations. In my case, I set a shutter speed according to the metering. Where to focus: Focus just on the labellum of the orchid to have a balanced depth of field between the front and back of the flower. You can use the PhotoPills macro depth-of-field calculator to do all the calculations. The blur of the foreground gives the final image a special atmosphere, resulting into an even more important subject. Iceland. Speechless. A photographic trip that marked a before and after in my photographic life. A place full of sensations, light and images everywhere. Two days before starting a photographic trip with some PhotoPillers, Rafa, Germán and myself got lost in the company of the guide, photographer and friend Donal Boyd in the Highlands, located in the center of the island. My eyes couldn’t believe such beauty. After wading a few rivers, the Sun's rays were strongly illuminating the immense landscape. I couldn’t help shouting "Stop Donal!" so he would stop the car. In a few seconds we were out camera in hand. As I was watching this scene I thought of Sebastião Salgado, on his light, in his "Salt of the Earth". The fog, the clouds, the mountains, the Sun... All of them had united to give me this opportunity. In this case, the exposure settings (f/5.6, 1/2000s and ISO 100) may seem inappropriate. However, the light changed very fast, we ran out of the car... So I didn’t have time to change the aperture according to the reciprocity law in order to have more depth of field. It could have changed to f/8, with a shutter speed of 1/1000s, enough to take the photo handheld. However, I preferred to start taking pictures as soon as possible so as not to miss the opportunity to capture that light and that moment. Gear: Camera (regardless of its sensor size). Anyone from a wide angle lens to a telephoto lens. Focal length: It depends on the type of landscape you want to capture. You can use from a small focal length (10mm, 14mm, 24mm, etc.) to cover as much landscape and sky as possible to a telephoto, as I used here (500mm), or a super telephoto lens. Shutter speed: Since you’re shooting in Manual mode (M), the shutter speed is determined by the aperture-ISO combination you select. Here, your personal style comes into play depending on how much light you want in the photo. White balance: Manual. It depends on the time of day and the quality of light. Nevertheless, you can always correct it in post-processing. As I got out of the car, I decided to use the "Cloudy" option. While I was in the car, I was impressed by the incredible light contrast of the scenes I was seeing. As light changed, just before getting off the vehicle I decided that this photo would look perfect in black and white. Obviously, I took it in color. Later, I post-processed it in black and white, resulting in what you can see it above. If someone had told me a year ago that I was going to take a picture of some Asian newlyweds posing in front of a glacier in Iceland I wouldn’t have believed it. But life is unpredictable and sometimes you find yourself in a myriad of surreal situations like this one. We’d just been shooting at the Jökulsárlón glacier, where we’d been waiting to capture the Arctic terns. I was carrying the Olympus with the 300mm lens and when we got back to the cars we found this scene. A happy couple of newlyweds were being photographed by a professional. I was at around 50m from them. So I was able to take a series of stolen portraits without disturbing them. Gear: Camera (regardless of its sensor size). A wide angle lens if you want a general scene or a telephoto if you want to capture an close up or a detail. Focal length: It depends on the type of photo you want to capture. You can use any focal length from a short one (10mm, 14mm, 24mm, etc.) to cover as much landscape and sky as possible to a long one (85mm, 200mm). Exposure mode: Aperture Priority mode (A or Av) to be able to take photos faster and not miss anything. Shutter speed: Since you’re shooting in Aperture Priority mode (A or Av), the shutter speed is determined by the aperture you select. Here, your personal style comes into play depending on how much light you want in the photo. I don’t usually shoot at shutter speeds lower than the effective focal length (in this case 600mm because of the Micro 4/3 cameras 2x cropping factor). But I shot at 1/40s with hardly any reaction time. I fully relied on the Sync IS system that manages to coordinate the camera stabilization systems, getting a compensation of up to 6 stops. Where to focus: Always focus on the main subject (the bride’s face, for example, making sure that the eyes are sharp). In wedding photography, I recommend that you use several lenses (from a wide angle to a telephoto lens). In addition, you need a spark of originality and, above all, spontaneity. I have photographed few weddings, but I have always tried to photograph spontaneous and ephemeral moments. These photos are the ones that generally surprise the couple the most when they review the work. I'm going to give you a safety recommendation. Whenever you can, shoot with two bodies and back up the memory cards as soon as you can. Today, many cameras have dual card slots, so another option is to make a copy directly on your camera. The advantage of this type of photography is that you hardly use any equipment. For starters, you need a pinhole camera. This type of camera has no lens and consists of a body (a box, a can, any closed container) with a pinhole, a tiny aperture, through which light enters. You also need to put a film or photographic paper inside, depending on the camera you have made. In this case I used the Holga 120 WPC (wide pinhole camera) with a Kodak film of 400 ASA monochrome ed 120mm. The most notable feature in this type of photography is that the depth of field is always infinite. The subsequent chemical development of the film and its surprising results make it impossible for me to get rid of the chemical process. At least every two months, I usually go out with some of my pinhole or traditional cameras, and enjoy the wait. It’s a life therapy. Gear: Pinhole camera. The one I used in this photograph is a Holga panoramic with 120mm film. The resulting negatives are 120x60mm. An ideal size for large prints. A stable tripod to expose a few seconds, minutes... or hours! Camera configuration: The photosensitive material is the monochrome negative. It replaces the sensor and, at the same time, is the equivalent of a RAW file. Focal length: The lens is the pinhole, a tiny hole (about 0.3mm in diameter). If you measure the distance from the hole to the film plane you get the focal length. In this case, 40mm. Exposure mode: Manual. The trigger is a simple lever that allows light to reach the film. Aperture: You can calculate it according to the diameter of the pinhole. I use Pinhole Assist (iOS) or Pinhole Calculator (Android). In this photo the aperture is f/135. Shutter speed: Basically, I calculated it following some exposure guidelines that are usually given for an ASA 100. As it was a sunny day, I metered the light with a hand held photometer and got an exposure of 8s. Then, knowing that the ASA of the film is 400 and using the reciprocity law, I shot at 2s. If you don’t have an exposure guide you can always calculate the exposure with an ASA 100 and an x diaphragm. Then, with the help of PhotoPills you can calculate the exposure for f/135. To do this, use the exposure calculator. White balance: There isn’t, so don’t worry about it. Where to focus: You don’t focus with this type of cameras because there is no mechanism to do so. And with an aperture of f/135 the depth of field is infinite so the whole scene comes out focused. In this case the pinhole is a 0.3mm hole. Taking into account that the distance to the film is 40mm, the aperture is 40 / 0.3 = 133.33. Rounding, f/135. After taking the shots, develop the negatives in a developing tank, let them dry and flush them in the laboratory. Nowadays, you can skip the last step and scan the negatives, although you lose some of the processing magic. Yes, I confess I’m a romantic lover of traditional photography. I enjoy it and it makes me disconnect. Go figure. If you have to be incredibly patient to get the final image with a pinhole camera, imagine how much more patience you need with solarigraphies. In this case I had to wait for six months. Yes, you read it right. Six months! I wanted to capture the transition from the winter solstice to the summer solstice and I did it. To properly position the camera and be able to capture the Sun's trajectories, I used the PhotoPills Planner to know exactly where the Sun would be at the beginning of each solstice. Let me briefly explain what this technique is about. Solarigraphy is a photographic technique in which you only use photographic paper and a pinhole camera (a can of cookies, soda...) prepared to be outdoors for a long time. The pinhole is an orifice (of a diameter of 0.25mm in this case) made with a pin on a piece of aluminum can and then taped to the can. The development occurs because the Sun burns the photographic paper day by day sculpting the final image. Once you’ve finished the photo, remove the paper from the holder and place it on a quality flatbed scanner. Do it as fast as possible because the image you see on the raw paper is ephemeral. If you wait for too long the light will impress the emulsion and you’ll ruin the picture. Don’t use the chemicals of an analogic development. Don’t use a fixer either. Since there are no silver halides developed, you don’t need to put the paper into a tray with fixer. If you did, you would completely ruin the photo and the waiting time! Camera configuration: The photosensitive material is the photographic paper. It replaces the sensor and, at the same time, is the equivalent of a RAW file. Focal length: The lens is the pinhole, a tiny hole (about 0.25mm in diameter). If you measure the distance from the hole to the film plane you get the focal length. In this case, 80mm. Metering mode: You can’t meter anything. Aperture: You can calculate it according to the diameter of the pinhole. I use Pinhole Assist (iOS) or Pinhole Calculator (Android). In this photo the aperture is f/320. Shutter speed: Depending on what you want to capture, you can perform a 1-month, a 6-month or a 1-year solarigraphy. You set the limit! ISO: The film’s ASA one. Where to focus: You don’t focus with this type of cameras because there is no mechanism to do so. And with an aperture of f/320 the depth of field is infinite so the whole scene comes out focused. Solarigraphies are incredibly surprising because of the traces the Sun leaves day after day in the paper. If one day is cloudy and the Sun isn’t visible, it won’t leave a line. Look at the spaces between lines in the picture above: these are cloudy days. Due to the circular support I used (a beer can), notice how the resulting photograph is an angular-looking image. This photograph was taken from the main bell tower of the cathedral of Ciutadella de Menorca. As we saw in section 23, a bracketing consists on taking a series of photographs of different exposures. Then, you blend them with an editing software (Lightroom, Photoshop, etc. ), and you get a photograph with detail both in the shadows and in the highlights. In other words, with the bracketing technique, you can generate a high dynamic range (HDR) image that fits the dynamic range of the scene. One of the major drawbacks of bracketing is that all elements of your scene must be static. Each shot must be identical to the others, except for the exposure. As you can see in the image above, the scene meets the requirements: it has a high dynamic range and its elements are static. Here, the idea is to get an image with all the highlights correctly exposed. And thanks to the bracketing, this is the result. Gear: Camera (regardless of its sensor size). A wide angle lens if you want a general scene or a telephoto if you want to capture an abstraction of it or a detail. An intervalometer. A robust tripod and ballhead. Sometimes, depending on the terrain you can use a bean bag that give a lot of stability. Focal length: It depends on the type of landscape you want to capture. You can use any focal length from a short one (10mm, 14mm, 24mm, etc.) to cover as much landscape and sky as possible to a long one (85mm, 200mm). Exposure mode: Manual (M). But you can also use one of the semiautomatic modes (A/Av or S/Tv) combined with the bracketing function that most cameras have. Depending on your camera, this function allows you to take a bracketing of 3, 5, 7 or 9 photos in which you set the difference of a third of stop, a half stop or a full stop between each one of them. Although this picture is not the case, you could take 5 exposures of -2EV < -1EV < 0 < +1EV < +2EV for example. Metering mode: Spot metering mode. Meter the brightest area of the scene you want with detail and overexpose it by 1 or 2 stops (+1EV or +2EV). Then recompose, focus and shoot. Here I used a little extreme settings because of the number of light zones. As usual, I spot metered the brightest light with detail of the scene. I recomposed and overexposed by 2 stops (+2EV). Then, I set the camera to take a shot according to the given metering and 3 exposures underexposing by 1 stop (-1EV) each and 3 more overexposing by 1 stop (+1EV) each as well. Aperture: From f/4 to f/16. Be careful to use from f/16 onwards to avoid diffraction because it ruins the sharpness and quality of the image. Here f/8 gave me enough depth of field and a very good sharpness, since I was taking advantage of lens’ sweet spot. Shutter speed: Since you’re shooting in Manual mode (M), the shutter speed is determined by the aperture-ISO combination you select. I took the first picture at 1/125s. Then I overexposed at 1/60s, 1/30s and 1/15s. Then, I underexposed at 1/250s, 1/500s and 1/1000s. White balance: Manual. Use an X-Rite ColorChecker Passport card to calibrate the light and correct the color cast dominant inside the cathedral, which was very warm. Nevertheless, you can always correct it in post-processing. The use of the bracketing technique helped me get an image perfectly exposed, from the shadows to the stained glass windows, including their reflection on the wall. I have to admit that still life photography has never attracted me too much. That doesn’t mean I don’t enjoy watching still life images of my friend Bosco Mercadal for example. I love his artwork. Another influential photographer in still life photography is Toni Catany, who recently passed away, and who was able to transform any object in a masterpiece. Other photographers who are an inspiration for me: Olivia Parker, Suzanne Cummings and Imogen Cunningham. The image you can see above is a small tribute to the photography of the last century. In particular, I took this still life for a poster of the exhibition of the history of the Artistic Circle of Ciutadella photography club. These are photographs from the 1950s that give life to a city and transport you into the past. I took it only with the help of a continuous light bulb and a reflector, playing with the depth of field. What does it take to capture a still life? An object, a good idea and light. And, of course, use those three things so you clearly convey the idea, your message, to the spectator. Gear: Camera (regardless of its sensor size). A wide angle lens if you want a general scene or a telephoto if you want to capture an abstraction of it or a detail. An intervalometer. A robust tripod and ballhead. Focal length: Medium telephoto (±85mm) or a very fast fixed focal (maximum aperture of at least f/2.8). Due to its sharpness and brightness I always have with me the 85mm f/1.4 lens when shooting portraits and products. Metering mode: Spot metering mode. Meter the brightest area of the scene you want with detail and overexpose it by 1 or 2 stops (+1EV or +2EV). Then recompose, focus and shoot. Aperture: It depends on the idea of photo you have in mind. In this case I opened the diaphragm to have a shorter depth of field. I wanted to give more importance to the ephemeral passage of time of the photographs and not to the camera. I chose to leave it out of focus but softly so the spectator can guess its shape. Where to focus: Focus at the closest picture, so the spectator’s view enters to the rest of the frame from there. Getting a good still life photo is a demanding job: the idea and the message have to be original so they reach the spectator. In this genre, you make the picture, you don’t shoot it. Since I started in infrared photography back in 2006, I have always wanted to experiment with "seeing" what we don’t perceive. I like to show my surroundings in a very different way from what I see. The landscape of this particular example seems imaginary and surprises the spectator. What looks like a snowy landscape is, in fact, a set of green grass pastures on the volcanic earth formations of Iceland in the middle of August. To create infrared images outdoors I always look for clouds with volume that stand out with the contrast of the scene and create a striking image. For 8 years I have used a camera converted to infrared, although I still have some filters like the Hoya R72. The difference between using a filter or using a converted camera is, among other things, the shutter speed. An infrared filter is practically opaque. Therefore, if you use a filter and depending on the infrared spectrum you capture and the type of low-pass filter on the camera, the shutter speed can be between 5-6s to up to 1min. So it’s impossible to take the shot hand held. Taking photos with the converted camera is much easier. In this case I use a filter that lets the infrared spectrum go through the lens (720nm approx.). Since I don’t need to put any elements in front of the lens, I can take photos hand held. Gear: Camera converted to infrared in which you changed the low-pass filter to an infrared one of 720nm. A wide angle lens if you want a general scene or a telephoto if you want to capture an close up or a detail. Metering mode: In infrared photography, the metering mode is the same as in other disciplines. But in this case, you get a resulting red image on the LCD and you’re not able to evaluate the scene well, so meter and use a bracketing of 3 shots. Aperture: From f/4 to f/16. Be careful to use from f/16 onwards to avoid diffraction because it ruins the sharpness and quality of the image. Here f/8 gave me enough depth of field and a very good sharpness, since I took advantage of the lens’ sweet spot. Shutter speed: Since you’re shooting in Aperture Priority mode (A or Av), the shutter speed is determined by the aperture you select. White balance: The resulting picture on the LCD is a completely red image. Calibrate the white balance to reduce that red and to see on the screen some more brownish tones, allowing you to better assess the final result. In this picture, the combination of a deep blue sky with voluminous clouds created an unreal sky, with completely black deep areas that contrast with the white color of the grass. In this type of photography, the subject is very important. Look for greens, contrast and a dreamy composition. It’s mandatory to develop the infrared images. Here, I chose a black and white edition. After writing the guide on total solar eclipse photography, it had to be put into practice. Fortunately, we were in an eclipse year, one of the most anticipated: the total solar eclipse of August 21, 2017... A worldwide event, and particularly magical in the United States. We didn’t think it twice. The whole PhotoPills team gathered and we used our Swiss army knife (PhotoPills) to plan the eclipse. In fact, we implemented a specific tool in PhotoPills to plan eclipses. In this video the Bard teaches you how to plan a solar eclipse: How to plan the total solar eclipse of August 21, 2017. Once planned, we bought the plane tickets... A new PhotoPiller adventure was waiting for us! Photographing the total solar eclipse of August 21, 2017 in Portland (Oregon, USA) has been one of the most fulfilling photographic experiences that I’ve ever had. It was amazing to be able to live a moment as spectacular as this. And it was also a challenge to capture each and every one of the phases of a total solar eclipse. On top of it, I enjoyed capturing that moment in full contact with nature. For this type of photos, you need to be very concentrated and to know beforehand the phases of a total solar eclipse. 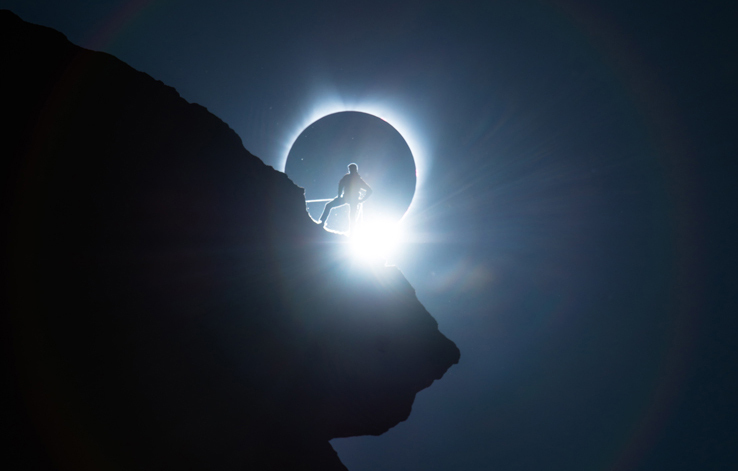 The diamond ring, the Baily’s beads, the chromosphere and the solar corona are different moments that occur just before or during the entire eclipse. The changes in light are spectacular and you need to set a shutter speed from 1/4000s to 1-2s if you want to capture everything from the faint reddish light of the chromosphere to the Moon covering the Sun. I decided that when the Moon began to cover the Sun I would take brackets of 9 photos with different base exposures. Thus, I would capture all the dynamic range needed to get a legendary picture. I chose this example to explain you how I took one of the most striking photos: the Baily’s beads, especially for the atmosphere that it conveys. When the light of the Sun illuminates the craters of the Moon, it forms light beams that combine perfectly with the warm bulges of the Sun. Gear: Camera (regardless of its sensor size). Here, I recommend you an APS-C or Micro 4/3 camera to take advantage of the cropping factor. A telephoto or a super telephoto lens. A sturdy tripod and ballhead, and an intervalometer. Focal length: Long focal length (300mm, 450mm, 600mm, etc.) to cover the area of the sky where the Sun and Moon are located so they take most of the frame. Metering mode: Spot metering mode. Meter the brightest area of the scene you want in detail and overexpose it by 1 or 2 stops (+1EV or +2EV). Then, recompose, focus and shoot. This is the theory but in this occasion and to avoid missing the moment (and the photo!) I took several bracketings. Aperture: Use a relatively narrow aperture so the celestial bodies are perfectly focused. Since this picture is a close-up, depth of field is not a critical. In this case I shot at f/8 to get the maximum detail of the chromosphere. Shutter speed: The fastest shutter speed that your camera lets you use, respecting the exposure triangle. The Moon moves faster than it looks and you only have a few seconds to capture the Baily's beads and the reddish color around the Sun resulting from the hydrogen emission. White balance: Manual. Nevertheless, you can always correct it in post-processing. In this photo I opted for a warm white balance (7460K) to capture the colors of the chromosphere. Where to focus: The first thing you have to do is to put the solar filter on your lens (this is essential if you don’t want the Sun to scorch the sensor!). Focus on the edge of the Sun. Use the Live View tool on your camera's LCD to make sure the Sun is perfectly focused. As soon as you mount the camera on the tripod, put the solar filter on your lens. Then, focus on the Sun as I just explained (using the LCD). Focus is key. Double check that you have focused correctly! A few seconds before totality begins, remove the solar filter to capture all the details of the eclipse. To make sure your photos are properly exposed, take a series of bracketings with different base exposures and covering the maximum dynamic range possible. These photos require practice, concentration and you have to be fast. But the results are so spectacular and a total solar eclipse is so rare that all efforts are worth it. I took this picture during a practice session with some students while a rally was held in Menorca. One of the exercises was to do a panning. You shoot using a relatively slow shutter speed as you follow the subject along its path with your camera. In this case, you follow the car from right to left. As you can see, the car seems frozen and the background and/or foreground blurred. To get a good image you need patience and lots of practice. Also, you have to be careful when deciding the shutter speed you’re going to use: it can’t be too short. If so, you would freeze the whole scene and your photo wouldn’t convey any motion. Depending on the element you want to photograph (runner, bike, motorcycle, car...), I suggest you to try different shutter speeds. Always slower than the one you would use to freeze your subject. Gear: Camera (regardless of its sensor size). A wide angle lens if you want a general scene or a telephoto if you want to capture a detail or a close-up. Focal length: It depends on the type of picture you want to capture. You can use any focal length from a short one (10mm, 14mm, 24mm, etc.) to cover as much of the scene as possible to a long one (85mm, 200mm) if you want to isolate the subject from the background. Aperture: In this type of photo the shutter speed is crucial so the aperture is the last thing you set, applying the reciprocity law. In this case I shot at f/22. I'm not a fan of such small apertures, but the time of the day and the light forced me to close it to get a slower shutter speed. Shutter speed: Since you’re shooting in Manual mode (M), the shutter speed is determined by the aperture-ISO combination you select. Here, you decide how much motion you want to show. In this case, the PhotoPills exposure calculator suggested a shutter speed of 1/125s. Where to focus: Always focus on your subject, the vehicle in this case, with AF-C (AF-continuous or servo mode) to make sure it’s sharp in the photo. In these types of photography your movements are very important. Follow the car from far away and press the shutter just when you have it in front of you. Make sure it’s as perpendicular to your position as possible, to prevent the subject from being blurred. Like panning, this technique needs patience and practice. I recommend you to use at least a medium telephoto lens to have a long focal length. While shooting, use a slow shutter speed and make a slight movement. Ideally, it should be a continuous movement from bottom to top or from one side to the other. There is nothing better than the trunks of some trees or a reedbed to practice this type of photography. I had the idea for this shot when I had my 500mm mounted on the gimbal ballhead and I was about to photograph birds near the torrent of La Vall in Menorca. Because of the softness of this ballhead and its stability, I thought of doing a vertical movement framing the reedbed while the shutter remained open. Focal length: It depends on the type of landscape you want to capture. You can use any focal length from a short one (10mm, 14mm, 24mm, etc.) to cover as much of the landscape and sky as possible to a long or very long one like the one I used here (500mm to compress the perspective and isolate the area I liked). Metering mode: Spot metering mode. Meter the brightest area of the scene you want with detail and overexpose it by 1 or 2 stops (+1EV or +2EV). Then recompose, focus and shoot. However, here I used the center-weighted metering mode because the light wasn’t changing much. Aperture: It depends on the depth of field you want. Since I didn’t want it to be very large I decided to use an aperture of f/5.6. This way the distant areas look a little blurred in the strokes as they’re out of focus. Shutter speed: Relatively long, use 0.5s as a reference and then "try and fail". In this case I used 0.7s. With such a slow shutter speed I had enough time to press the shutter and make the movement from the bottom to the top that I wanted. Where to focus: Focus on the elements closest to your lens. Here, in the first branches. Take the picture and check that everything is the way you like because depending on how blurred the elements are or how you moved the camera the motion will be visible or not. Make sure the photo is correctly exposed (check the histogram). Otherwise, adjust the exposure accordingly. I don’t recommend shooting (that starts the exposure) and doing the movement simultaneously. Shoot first and then start making the movement. Hold on for a moment so the details look better. For example, if you want to take a picture of 1s, wait 1/4s and then start the movement from the bottom to the top. If you can complicate it, why make it easy? That's what we thought when planning this picture. We wanted to blend some Star Trails with the fire show that the steel wool produces. Obviously, we did so in a location where there was no danger of fire! I first shot the steel wool picture (14mm | f/2.8 | 11s | ISO 1600 | 3200K). Germán was standing behind the old stone structure, burning the sparking steel wool. Once I took the steel wool shot, I used the intervalometer with the settings you see in the caption and hit the start button. With the next 195 photos, I managed to capture Star Trails. Metering mode: You can’t meter light because there is none. Determine the exposure by taking test pictures and checking the histogram to see if it’s correct. You can do reciprocity calculations with the PhotoPills exposure calculator. Aperture: If you use the widest (for example f/2.8), you can capture many stars. Shutter speed: It depends on how you want the final photograph to look like. You can take pictures using the NPF rule or the 500 rule to have the stars as big bright spots or use slower shutter speeds if you don’t mind minor Star Trails (15s or more). After all, you'll use a software to stack the photos and get the final Star Trails image. You can use the PhotoPills Star Trails calculator to calculate the total shutter speed you need to get a certain Star Trails length. ISO: If you take multiple exposures to obtain Star Trails long enough, both the shutter speed and noise determine the aperture and ISO settings you can use. The biggest problem you have is noise. So, keep the ISO between 400 and 1600, depending on how much light you work with. If you want to capture the color of the stars, don’t go over ISO 1600. By doing so you’ll preserve the colors of the stars. Since you only want to add light from the stars, use a low ISO to capture only the stars’ spotlight. Illumination: Illuminate the foreground with the light of the steel wool. When you are about to start capturing the Star Trails, check that everything is focused on the first photo. Do all the tests at the beginning because, once you start the shooting, you can’t change anything. Make sure the photo is correctly exposed (check the histogram). Otherwise, adjust the ISO accordingly. The only way to improve is to shoot and make mistakes. You learn a lot failing. That’s why I leave you here a list of the most common mistakes that students make in my courses (and that I myself did). The aperture not only allows you to control how light goes through the lens, it also helps you to control the depth of field (DoF). Do you want most of your photo to be out of focus? Open the diaphragm wide (use a low f number, such as f/2.8 or f/3.5 for example). Conversely, do you want most of your image to be focused? Close the diaphragm instead (use a high f number, such as f/8 or f/11 for example). And if you want to take your photo to the extreme and have all the elements in focus, focus at the hyperfocal distance. Once this is done, focus again and make sure that you are focusing a distance slightly above the hyperfocal. Focus at 0.5m or 1m beyond the exact hyperfocal distance. Above all, make sure you are not focusing at a distance closer than the hyperfocal distance. Learn how to focus at the hyperfocal distance by reading this explanation or through this video. A picture out of focus is an image where the focus isn’t where it should be or where you wanted. The only solution is to learn to focus correctly. If the photo is out of focus, it’s almost impossible to "fix" it. A blurred photo occurs when you shoot at an excessively slow shutter speed and the camera's own movement prevents the final image to be tack sharp. The result is a fuzzy photo. To solve this problem, simply increase the shutter speed or use a tripod. As a rule of thumb, you won’t get a blurred picture if you shoot at a rate equivalent to 1s divided by the focal length you’re using. You can also end up with a blurred image if you’re shooting at between 1/15s and 1s on a tripod with a telephoto lens. In this case, use the mirror lock-up (if you’re not using a mirrorless camera). Finally, a photo can also be motion blurred. This usually occurs when you are shooting in motion or during a long exposure if the tripod isn’t well stabilized. For example, if you are in a moving vehicle and you don’t use a fast shutter speed, your camera won’t be able to freeze the scene, so it’ll be motion blurred. In this case the solution would be to use a faster speed. Another example would be a night photography or a long exposure with filters. If you haven’t properly fixed the tripod on the ground, it could shake while you’re taking the picture, and it wouldn’t be sharp. Or you probably hadn’t tightened your ballhead properly, and the camera was falling downwards as you were exposing. In both cases the solution is to make sure that the tripod is completely stable in the ground by securing it and making sure that the ballhead is tight. Your photos can be blurred for various reasons. You want to freeze motion but you have used a slow shutter speed. Use a faster one. And if you're shooting in Manual mode (M), remember to set the aperture and ISO to get the same exposure. You want to take a long exposure, leaving static certain areas of the elements in your frame while others are moving. If your photo is blurred it's because your camera and your lens have vibrated during the shooting. Use a sturdy tripod that bears the weight of your equipment. Make sure it’s in a stable position and not in contact with anything that can make it vibrate. Turn off your lens stabilization system. You’re using a tripod so you don’t need this feature. When the lens doesn’t vibrate, it may try to correct non-existent movements, causing the opposite effect. Use an external shutter release (wired or remote), an intervalometer or your camera’s self-timer. Avoid touching your camera as your finger will cause a vibration. In general, if your photo has a lot of noise it’s because you’ve used a very high ISO. To avoid this noise you must reduce the ISO setting, letting more light to the sensor. Either you open the diaphragm to increase the aperture. Or you increase the exposure time, so the shutter is open during a longer period of time. The problem with automatic ISO is that you allow your camera to be the one that determines it. You risk letting it set an excessively high ISO and your photo ends up with (a lot of) noise. As a rule of thumb, regardless of the camera model you have, use the lowest ISO possible. If you have a mid-range or high-end camera, the automatic ISO can be of great help as long as you set an interval. If your camera generates noise from ISO 1600 for example, set an automatic ISO range between 100 and 1600. From there on, you can play with the aperture and shutter speed knowing that it’ll be the camera that determines the ISO, without going beyond 1600. That's because you haven’t let enough light reach the sensor. Select a wider aperture if you want to control motion (which means you don’t want to change the shutter speed). Select a slower shutter speed if you want to control depth of field (which means you don’t want to change the aperture). Crank up the ISO (but be careful with the noise!). Use the exposure compensation tool (±EV) by moving the indicator to the right (positive scale) if you aren’t shooting in Manual (M). In this case the sensor has captured too much light. Select a narrower aperture if you want to control motion (which means you don’t want to change the shutter speed). Select a faster shutter speed if you want to control depth of field (which means you don’t want to change the aperture). Use the exposure compensation tool (±EV) by moving the bar to the left (negative scale) if you aren’t shooting in Manual (M). And that leads you to an incorrectly exposed photo. It’s probably because you are using the evaluative (or matrix) metering mode. This mode is often accurate, but not always. Use the spot metering mode. It’s much more accurate. Depending on the camera, it may be a very small circular area right in the center of the frame or the selected focus point. When you shoot in one of the two semi-automatic modes, whether in Aperture Priority (A or Av) or Speed Priority (S or Tv), the best way to correct the exposure is to compensate it. Too dark (underexposed), shift the exposure compensation indicator (±EV) to +1. Look at the histogram of the new photo and evaluate if it’s necessary to take another shot at +2, +3, +4, etc. Too bright (overexposed), shift the exposure compensation indicator (±EV) to -1. Look at the histogram of the new photo and evaluate if it’s necessary to take another shot at -2, -3, -4, etc. By keeping the white balance in automatic, sooner or later you’ll face a situation where your camera has failed to correctly capture the colors of your scene. If the colors in your photo are warm (there is a red, orange and yellow cast), cool down the colors by reducing the color temperature (select a lower Kelvin number). If the colors in your photo are cold (there is a purple, blue and green cast), warm up the colors by increasing the color temperature (select a higher Kelvin number). Most of the time this problem happens because of a wrong metering. Your camera's light meter suggests correct exposure values when the element where you meter the light on has a neutral gray tone (it reflects 18% of the light it receives). 18% of light and you will make sure that both blacks and whites have the right color in your pictures. Use the spot metering mode. Measure the light on a neutral gray card that receives the same light as the subject you are photographing. Don’t rely on the image that your camera’s LCD shows to determine the exposure. Even if you’re shooting RAW (which you should do already, if you still don’t) your camera is unable to show the histogram of a RAW file. In fact, your camera shows the histogram of the developed JPG file that is embedded in your RAW file. Always use the histogram. It’s the most reliable tool to expose your scene. It won’t be the first time, nor the last that I recommend you to follow the work of great photographers. It’s, without a doubt, the best way to inspire you, to experiment and, above all, to evolve learning. So every time you find an exciting photo or even a jaw-dropping one, look at it for a few minutes. Observe it carefully and analyze it in detail. What elements does it include? Where has the photographer focused? What is the key tone? How did she meter the light? What exposure method did she use? What parameters did she use (aperture, shutter speed, ISO)? How has it been post-processed? If you do it, you’ll see how little by little you will come up with ideas and multiply your chances of taking spectacular photos. If you don’t know where to start, here’s a list with some of my favorite photographers. They are all true masters. And if you can think of another photographer, don’t forget to share it in the comments section at the end of this article! Simply the most renowned Spanish nature photographer of all time! José Benito Ruiz has won (and also participated as jury) several international competitions like Wildlife Photographer of the Year or the Golden Turtle. His photos have been published in more than 40 countries through the most prestigious agents (Planet Earth Pictures, Oxford Scientific Films and Nature Picture Library) in pro for the preservation of Nature. Devoted naturalist and author of more than 10 books on photography and wildlife, when José is not writing or out there shooting, he is teaching others the art of photography. Eat. Create. Sleep! Michael Shainblum has been creating art as a professional photographer/filmmaker since the age of 16. And this is all he longs for: Creating Art. Well, he also loves playing with Legos and doodling comics strips. Isn’t it Michael? His stunning photography and timelapses have gained him international fame. His work has been published in National Geographic, Wired Magazine, Huffington Post and The Weather Channel among others. He has worked for companies like Disney, Google and Nike, just to mention a few. And with more than 488k followers on Instagram, he is continuously inspiring the world. Trey Ratcliff's work became popular when the Smithsonian Institute posted one of his photos on its walls. His particular way of executing bracketing and, above all, of post-processing his images (usually using the HDR or high dynamic range technique) has given him an unmistakable style. In addition, his passion for traveling has taken him to the farthest destinations on the planet. He is, as he defines himself, "a warm-hearted, old-school gentleman explorer with really cool toys". As you can see, he has a very peculiar sense of humor. His experience, his way of understanding photography and his simplicity have made him a tremendously popular and successful photographer. For Rafa Irusta, photography is a way of transmitting sensations, considering that nature deeply moves him. His main objective is to document the beauty of the natural environment, always with the aim of raising awareness and inspiring a will for its conservation among the spectators. Thanks to a very purist style, Rafa tries to achieve images of great realism and beauty while using nature as a source of inspiration. This allows him to capture a multitude of fascinating scenes, playing with both lights and colors. Donal Boyd has been into photography for more than 10 years. First as an amateur and, since 2015, as a professional. That year, he decided to follow his heart, quitted his job and moved to Iceland to operate his business as a professional photographer and photography instructor. His mastery of light, combined with an extensive knowledge of PhotoPills, help him to achieve stunning nature images, his favorite genre. In his gallery of images you’ll see his passion for both landscape and wildlife. Oh! And he has a drone too! This award winning photographer has been published amongst some of the biggest media channels in the world, like Time, Huffington Post, Daily Mail, National Geographic and so on. When you meet Albert Dros you realise that he is truly addicted to landscape photography and capturing the beauty of the world. He is obsessed in fact! His goal, to capture places in the best possible way. His method, to plan every single detail to achieve shots that are stuck in his head: Imagine. Plan. Shoot! Samuel Aranda is one of the most prestigious and renowned Spanish photojournalists. In addition to the World Press Photo (2012), he has won multiple awards, such as the National Photography Prize in Spain (2006), the Nikon Photography (2015) and more recently the Ortega y Gasset Prize (2016). He has been photographing conflicts, immigration and social problems around the world for over 15 years. His work has been published in National Geographic, The New York Times, Le Monde or El País for example. A large part of his work is shot in black and white, usually very dramatic, seeking to represent in the most realistic way what his eyes see. He is, without a doubt, one of the most awarded nature photographers nowadays. Bencé Maté starts to become interested in this genre at the age of 14, soon getting his first success: in 2002 he wins the BBC Young Nature Photographer of the Year. In 2005 and 2007 he won the Eric Hosking prize. He has been 5 times Young Nature Photographer of the Year in Hungary, his native country. The following year he won the Nature Photographer of the Year from naturArt (Association of Hungarian Nature Photographers). He’s specialized in bird photography, thanks to which he earns his living as a professional since 2004. His images are incredibly original thanks to the equipment and shelters he builds. If you love photographing the Milky Way, you probably know Lonely Speck, one of the most famous and useful blogs to learn astrophotography in the net. Through Lonely Speck, Ian Norman and his wife Diana Southern inspire thousands and thousands of photographers to take action, go out and photograph the night sky. They have inspired me on more than one occasion to plan photos that I never imagined possible. Wildlife photography captivated Marina Cano when she was only 15 years old. Her images reflect sensitivity, passion, perseverance, creativity, sense of aesthetics, and above all an unconditional love for animals. A large part of her work takes place in the African continent, which she calls "her park, her little Africa". But for Marina, photographing nature has become more than a passion. Her goal now is to do everything possible to protect them by awakening the interest and curiosity of the spectator: to teach him about conservation. Oh! You can also get inspired by PhotoPillers from around the world. Check the images that we’re featuring everyday in the PhotoPills Awards. You can access all the photos from the Awards button you’ll find in the “My Stuff” menu of your PhotoPills app (or in our Instagram account). And you can submit yours too, and inspire others. If you are here, reading these words... Congrats! You have managed to get safely to the last screen of the famous videogame "Perfect Exposure", and you are about to rescue the princess. You only have to put into practice what you’ve learned! I admit that the game hasn’t been easy. You've had to destroy countless villains. All of them terrifying. And with equally terrifying names... Do you remember them? I know... It hasn’t been easy to get here. As in all video games, the difficulty has increased as you went to the next level. But the most important thing is that you didn’t give up, that you continued reading, that you overcame all the obstacles... You kept playing. And now, at last, your mastery of light and, thus, of exposure, is total. Your ability to make truly legendary photographs is infinite. You just have to prove it in the field, the moment that you’ve expecting for so long has come... Your time. So turn off the computer and take the camera. Go from theory to practice, from fiction to reality. You know, the world is divided into two categories... Those who know how to expose and those who don’t. You just have to decide which category you want to belong to. So unleash your creativity and put into practice everything you know. No matter how crazy your idea is, go for it! And if you don’t get it the first time, review this guide, learn what it takes and try again. Practice, practice and keep practicing. Don’t despair or let yourself be carried away by frustration. In the end, if you don’t give up, your efforts will be rewarded. I'm sure you'll take the photos you dream of. On top of it, you’re not alone in this game. You already know that you can count on me and the rest of the PhotoPills team regardless of what you need. We PhotoPillers are here to help each other! So no matter the question you have, if you need help, write a comment at the end of this article, and we’ll answer you as soon as possible. Antoni Cladera is a landscape and conservation photographer. Artist of the Spanish Confederation of Photography and member of the Spanish Association of Nature Photographers (AEFONA). He's a part of the PhotoPills Team.